This trip report will focus on the trip that my wife Nikki and I took to Florence and Tuscany in the period from July 17th - 27th 2007. In Florence we checked out places like Galleria dell'Accademia to see David, Uffizi Gallery, the Duomo, Ponte Vecchio, Pitti Palace (Palazzo Pitti) etc. 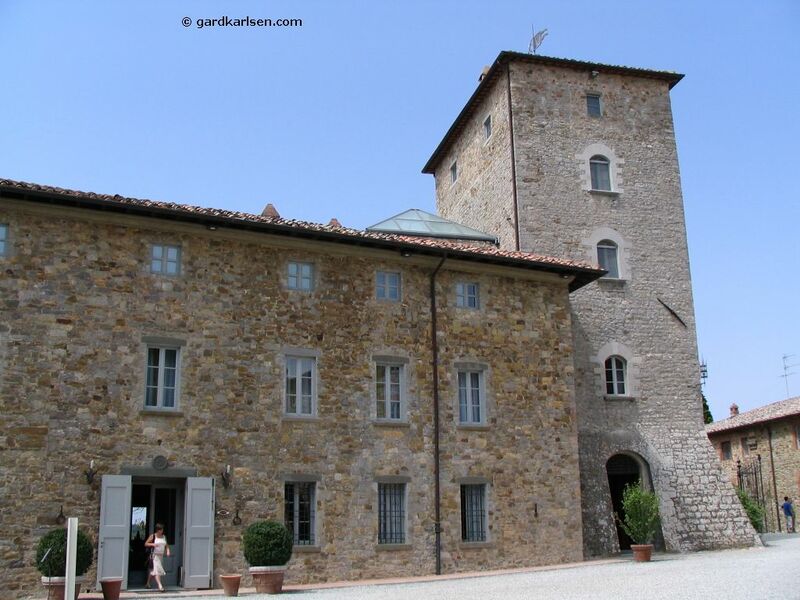 This part of the trip report will focus on our 6 day stay in Tuscany in Castellina in Chianti. Please get in touch if you have any questions or comments. All pictures are taken by Nikki and Gard with our Canon Powershot S1 IS camera. 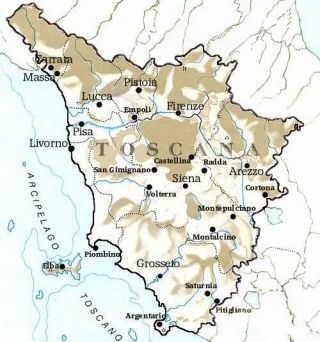 Click here to check out the Tuscany Google map which will indicate where attractions are located etc. In 2003 we went to Milan and Venice and we had a great time there. After that we decided that it would be nice to visit Italy again and in 2005 we went to Rome and that was also great. 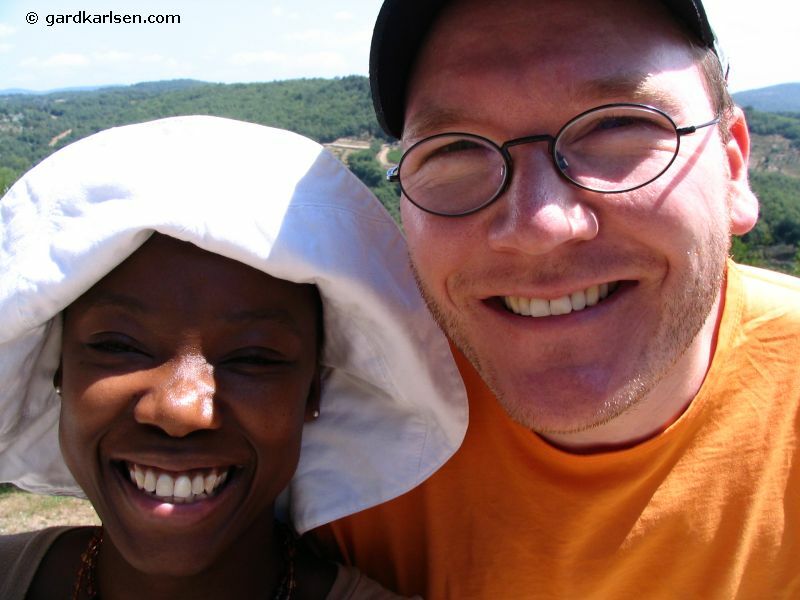 So when we planned a vacation this year we decided to check out Florence and Tuscany as it’s short travel time from Norway and we had a limited number of days for vacation. 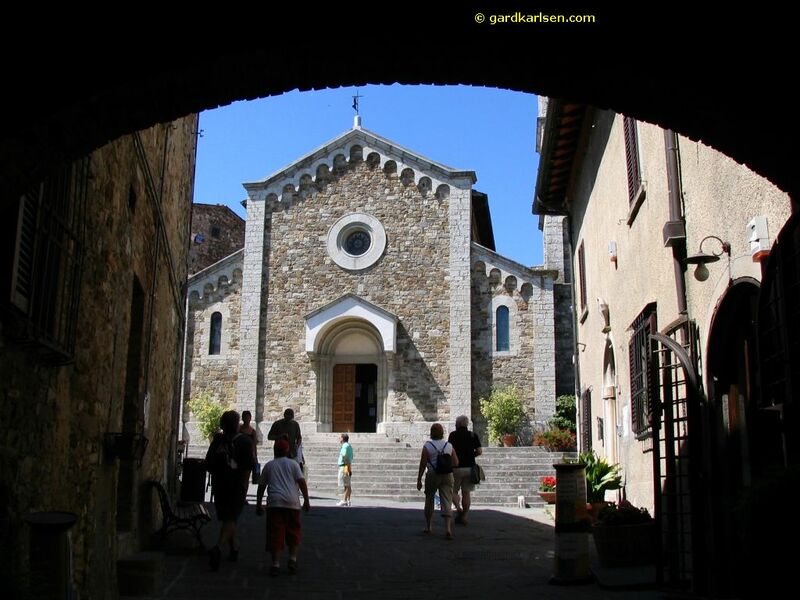 In order to appreciate this trip report to the maximum it might also be useful to check out the other trip reports that we have made from Italy for some other useful tips. Once we had decided on a destination we tried to find plane tickets. We decided that we wanted to fly right to Florence, not to e.g. Venice/Bologna as we had limited vacation time and we didn’t want to spend extra time getting to Florence by bus/train. We ended up buying the tickets through the Norwegian online travel agent Reisefeber.no. The plane tickets with Lufthansa cost about 3000 Norwegian kroner (about 375€) per person. To get a better understanding of the city we bought the Eyewitness travel guide for Florence and Tuscany. 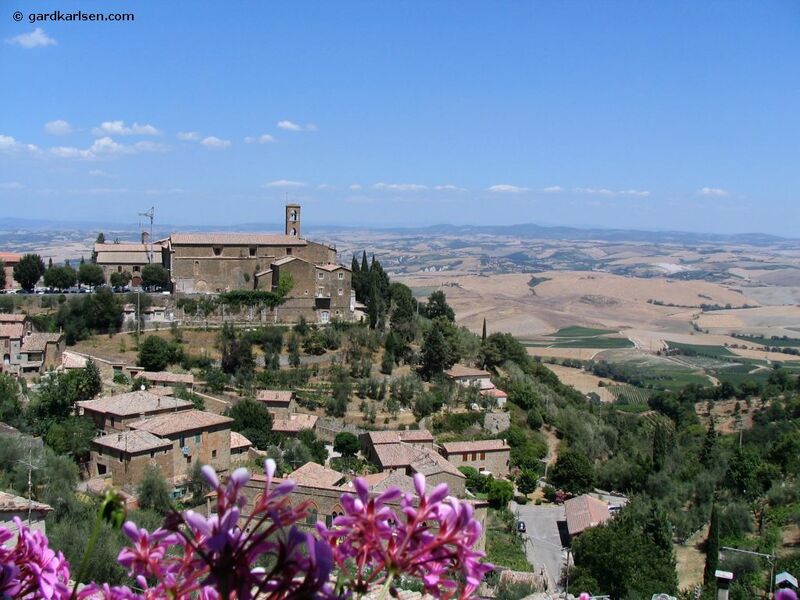 The second part of our trip would take us into Tuscany. 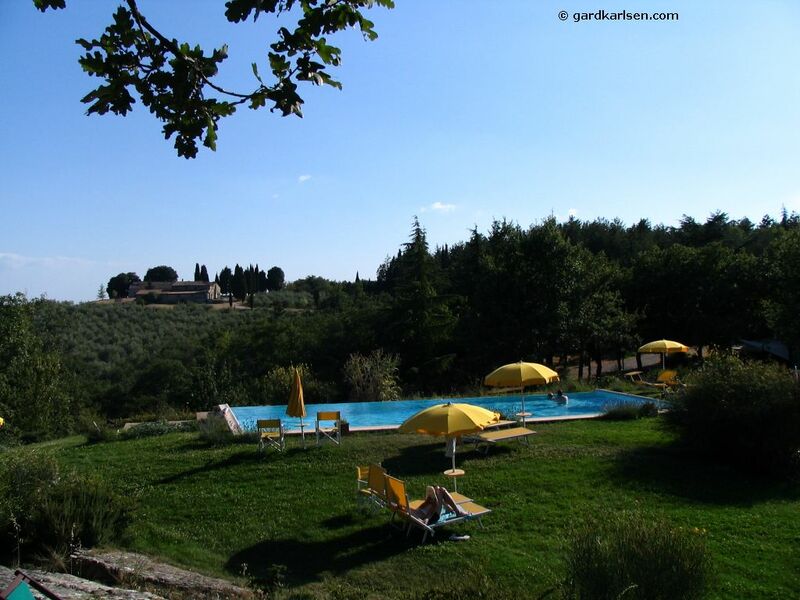 We booked a car through Avis (class B for 275€ for 6 days) and we also booked a room at an Agritourismo place called Villa di Capovento near Castillina in Chianti. 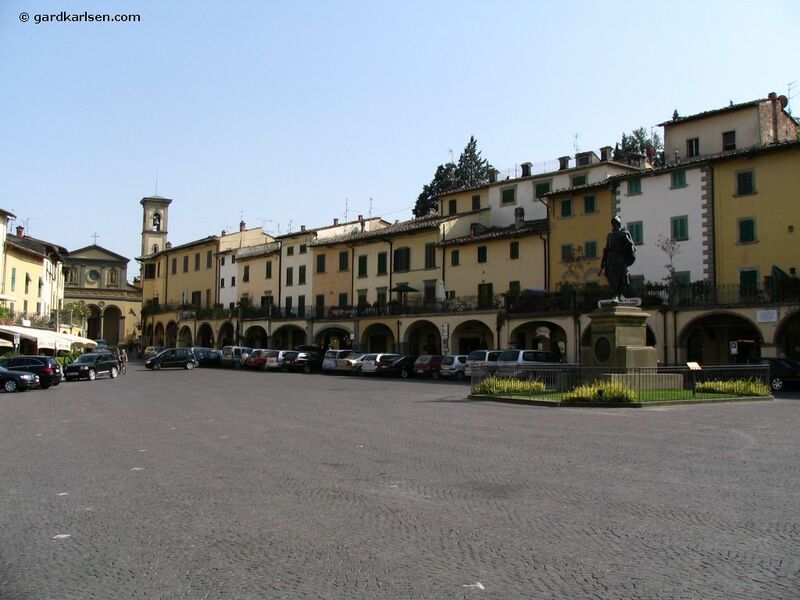 After we had been to Florence and Pisa (please see separate trip report for this trip) we set the GPS for Castellina in Chianti and instructed the GPS to keep us off the highways. We started out in Pisa and we drove towards Florence again and as we didn’t have a good map we just had to trust the GPS. 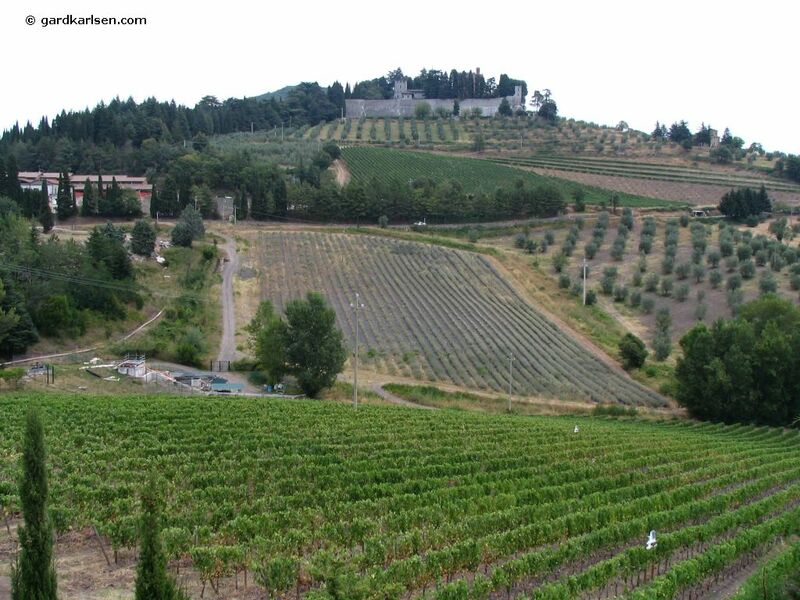 We were almost back in Florence when the GPS instructed us to turn south and we headed of into the Chianti area. 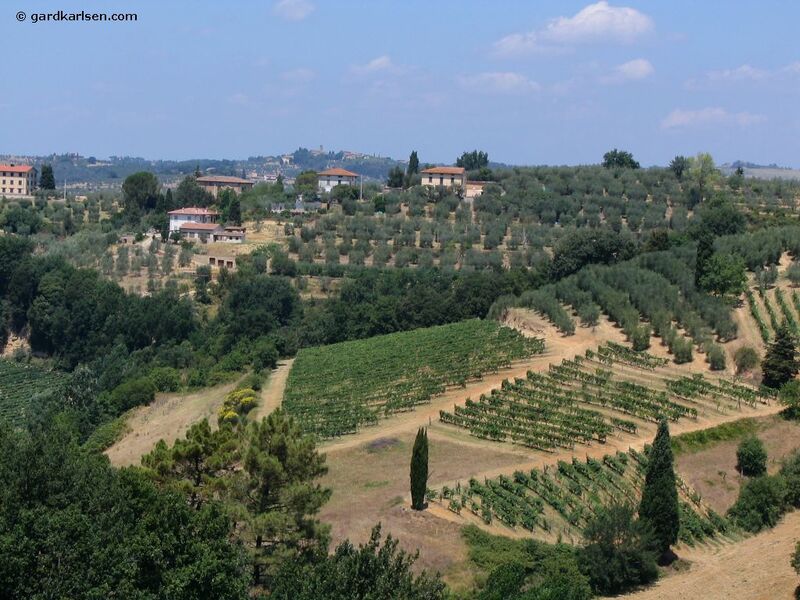 The Chianti area is famous for the landscape, the Chianti wine (made from the Sangiovese grapes), the food, the olive oil etc. Going out of Florence by car we soon found ourselves in a beautiful landscape of rolling hills. Our poor small rental car really had to struggle in some of the hills as it was very steep. 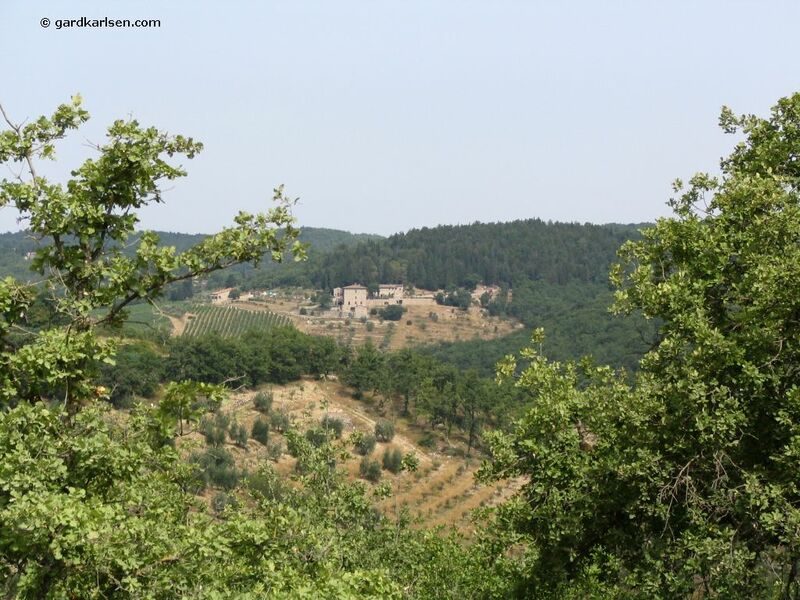 As we were getting closer to Castellina we stopped at one lookout point and the first thing that I noticed was the serenity and how quiet it was, it just seemed like a very peaceful place as we were driving past olive trees, wine ranks, sunflowers etc. As we were late in the planning it was a bit hard to find a place to stay in Tuscany, at least to find a place that fulfilled our requirements :-). We wanted a nice place, not to far from a small town, we wanted a pool etc. I did some research on a Danish site and it was possible to set up search criteria there. Through this Danish site called In-Italia the price for the room at Capovento was about 140€ but when I got in touch with Capovento directly we got the room for 110€ including breakfast. 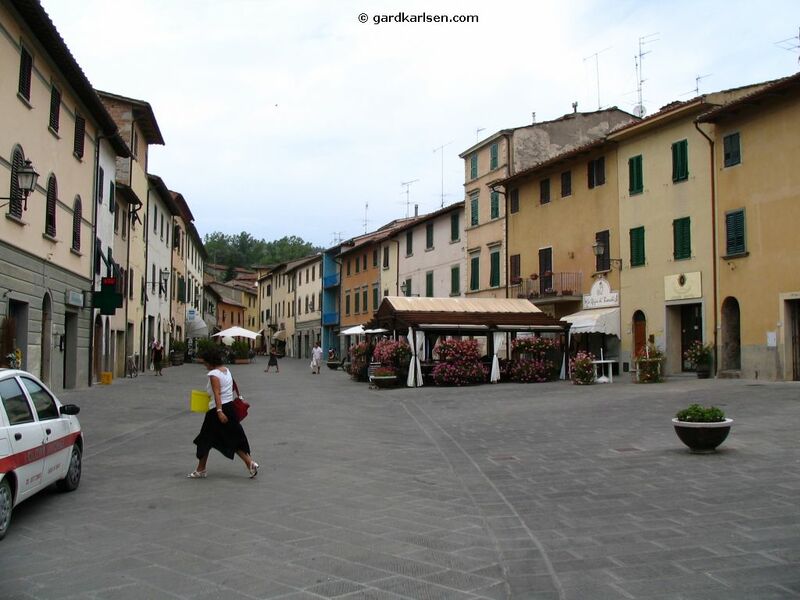 We came to Capovento at about 7 PM at night but it was not hard to find as there were signs pointing towards it when passing through the small town of Castellina in Chianti. 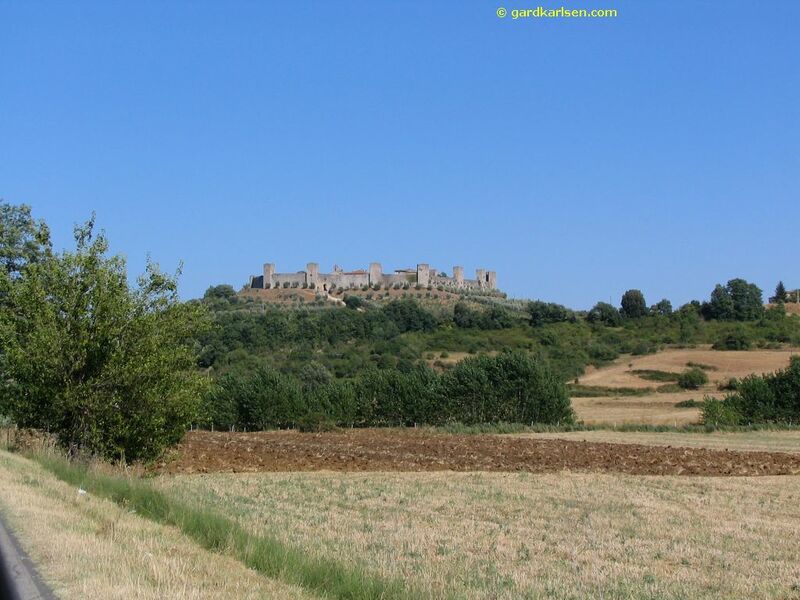 So after you have passed through Castellina going south (towards Siena) you will see a sign to turn left. Follow the dirt road for about 2.5 km and you’ll reach the house. We were welcomed by a elderly man when we came there and I just assumed that it was the owner but it turned out to be Daniele, the father of the owner and the man who seems to make all the art for the place. Everywhere in the house there seemed to be paintings made by him and they gave the place a nice personal touch. We got the room Padone which is located on the ground floor and with a view towards the pool. The view was not the best as it was straight out to the “winter garden” and Daniele’s painting studio. 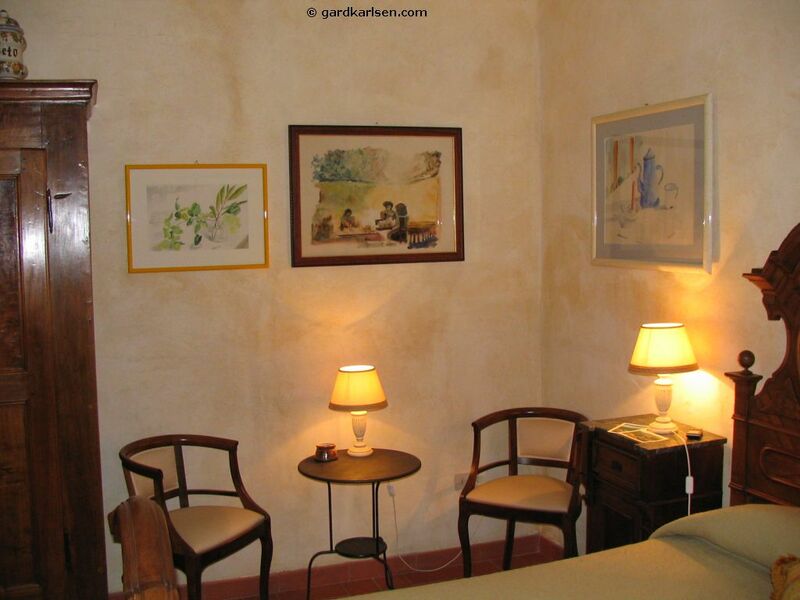 The room was painted in light colours with the same colour on walls and ceiling and there were tiles on the floor. 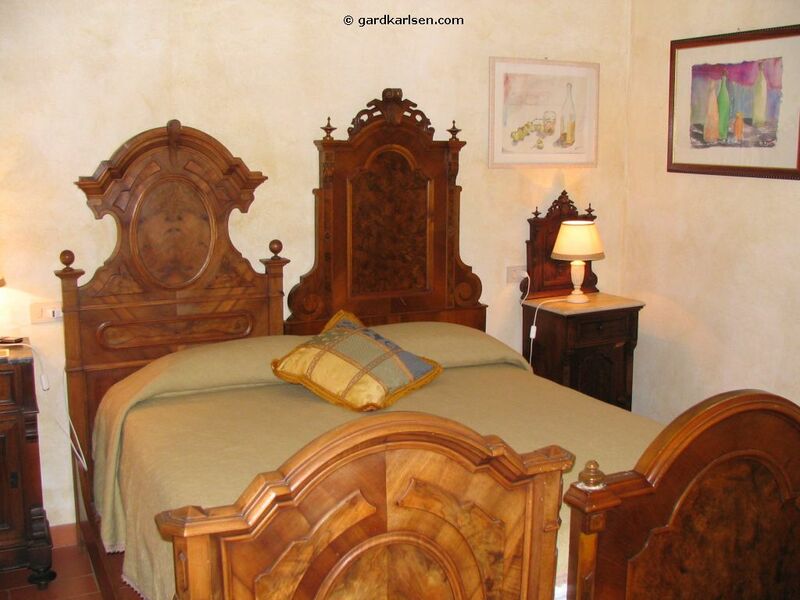 The bed and the rest of the furniture were of dark wood and seemed to be old family heirlooms and made it cosy. 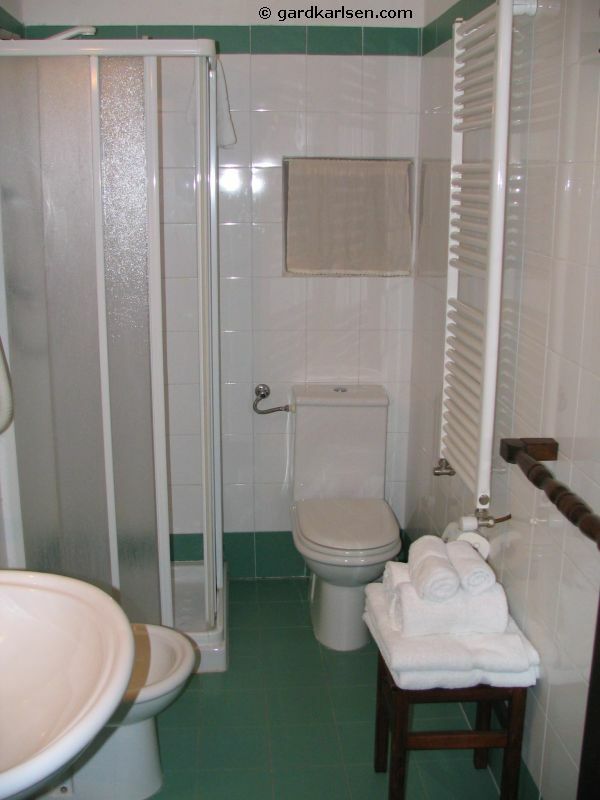 The small, tiled bathroom had a tiny shower cabinet and no amenities apart from the hand soap and the hairdryer. There was only a small window so it did get a bit “stuffy” in there. The breakfast was served outside the house each morning from 9 am and at this time the temperature was still pleasant. The breakfast was a simple selection of some ham cheese, bread, fruit, a couple of different flavours of juice, some cereal etc. It was also possible to order coffee from the kitchen and it was nice to start the day with a real cappuccino, espresso or macchiato. We saw that others ordered eggs and we also ordered scrambled eggs a couple of days…later on it turned out that this was added to our bill. I would have liked to be informed about this in advance. The pool was located about 20 meters from the house and it was very nice to jump in there after we had arrived. We had driven all day and it had been pretty hot and it was a nice way to cool down. The pool was larger than expected and it was deep on one side (it must have been 2.5 meters deep). But I assume that it is not heated in any way as it was quite refreshing (read cold). So I guess it can be pretty freezing if you visit the place in the spring time. Capovento also produces olive oil which is for sale. It looked like the reviews in the olive oil “bible” was pretty good (not that I speak much Italian :-). Capovento was a really nice place, located not too far from Castellina and in the middle of Chianti which makes it ideal for a base if you are going to check out the Chianti area. The old house is the old family house of the owner Giulio and it did have an atmosphere as we were staying at someone’s home. The service was good and especially Daniele seemed to enjoy guiding and talking to the guest. There is a bit of room for improvement when it comes to information but all in all we had a wonderful stay there. There are parking lots on the outskirts of town and it was never a problem finding a place for the car. There is also a Shell gas station right outside of town if you have a rental car and need to fill up the tank. Note: Gas stations in the area seems to be closed on Sundays. And in Castellina the gas station even closed up during the siesta. We made a short stop by Gelateria L'Antica Delizia which is located on the way out of Castellina before we set the target San Gimignano on the GPS and drove west. 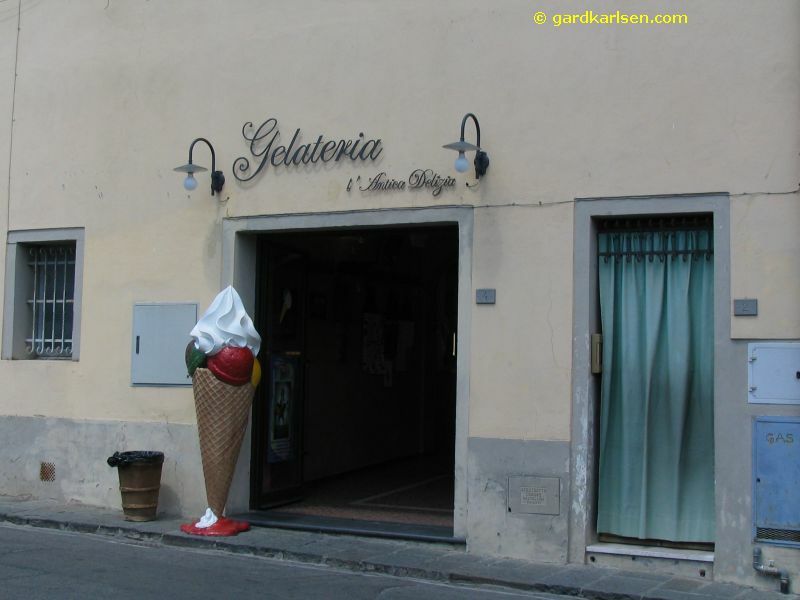 The gelateria serves wonderful gelato (ice cream) and it was great to have something cold in the summer heat. On the way we had to make stops along the road to look at the beautiful landscape so be warned: the roads are full of turns and ups and downs, and locals in a hurry, so make sure to keep the eyes on the road even if it is tempting to gaze at the beautiful landscape. 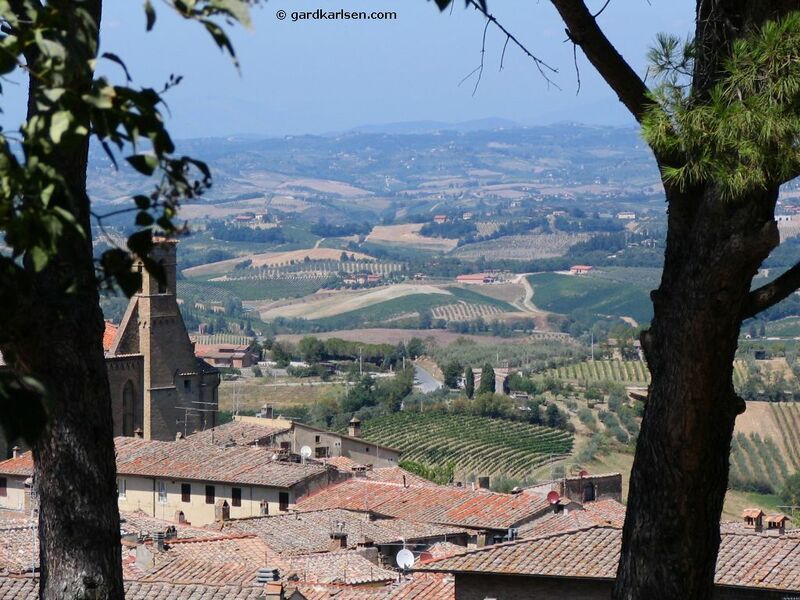 It didn’t take us that long to get to San Gimignano as it was only about 25 km from Castellina. 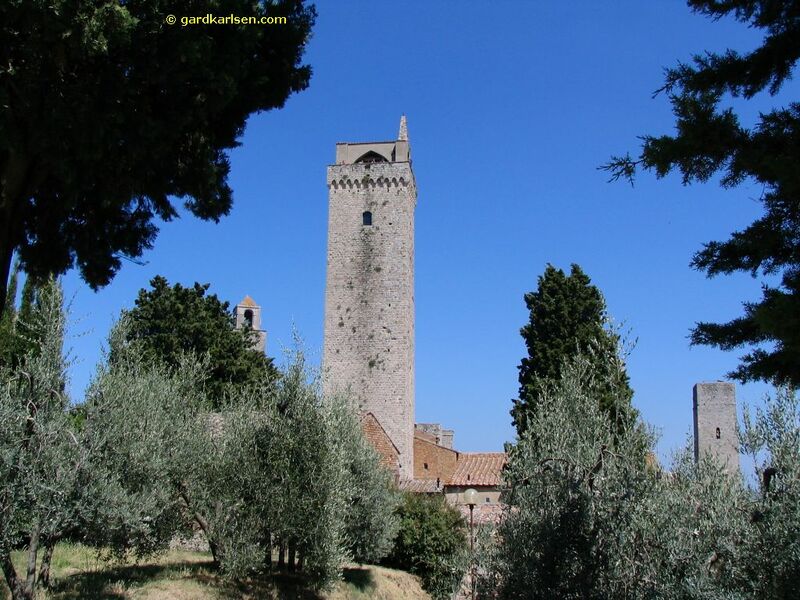 I’m not sure where I first heard about San Gimignano (which I’m still struggling to pronounce) but it seemed to pop up on all the forums when people where talking about going to Tuscany and I also saw it on the travel channel only weeks before we went to Italy. When we arrived there were lots of signs to various parking lots and it was easy to see that it was a popular place. 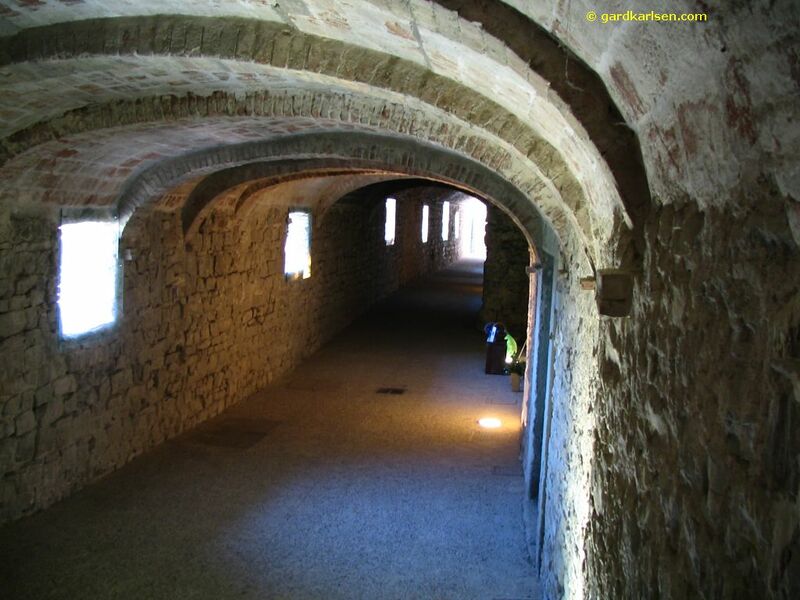 It is said that you should arrive early or late in San Gimignano or spend the night there to see what it is like once the day tourists have gone. 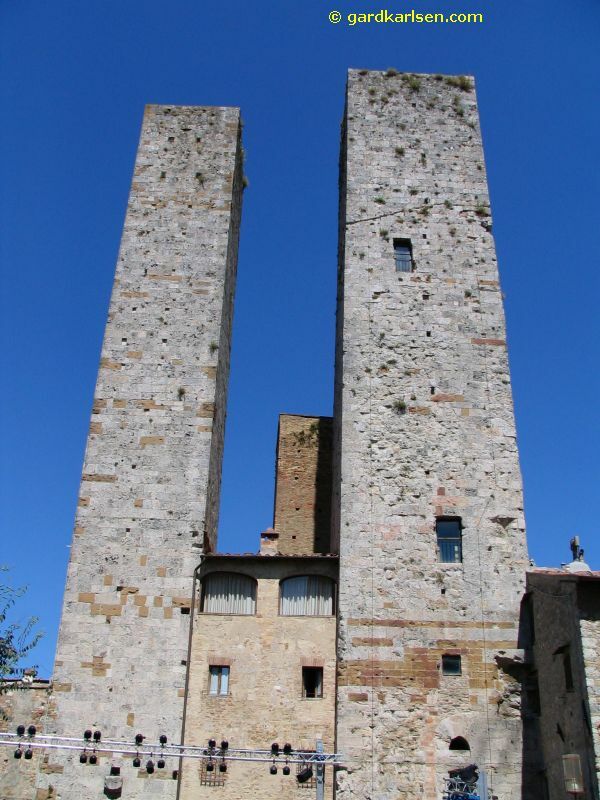 “The city of the beautiful towers” as the guidebook refers to it has gotten this name from the 14 medieval towers from the 13th century. There used to be 76(!) of these towers and it used to be a private fortresses and let’s admit it - to show off :-) We walked around in the town for a couple of hours, went up the top of the city fortress (Rocca) and enjoyed the view from there etc. 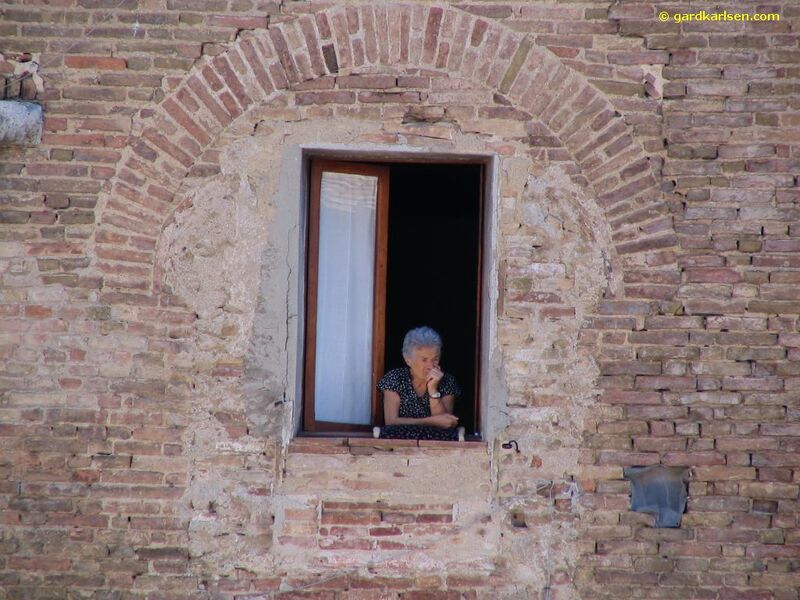 San Gimignano is beautiful but there is only one slight problem: all the tourists :-) . 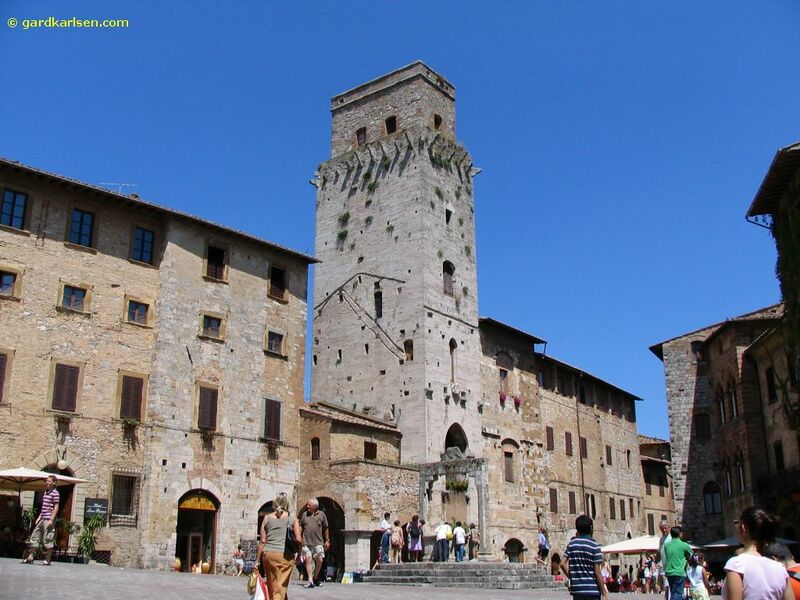 The problem is that San Gimignano is a tiny city but there are thousands of tourists pouring in every day. It just became a bit too much of a “Disneyland” for my liking. I got a bit of the same feeling when I went to Venice a few years back too. My recommendation when it comes to Tuscany is: come to San Gimignano very late or very early and get out of there during “rush hour” or else your impression of the city will be ruined. The alternative is of course to visit some of the other wonderful towns that are around in the area. Tip: If you’re not a biscotti fan but would like to try it, buy a packet of chocolate with giant chocolate chip bits - Nikki, a chocolate cake fanatic, was not entirely willing to share this new found gem. On the way back to Castellina we were overtaken by a guy on a Harley-Davidson StreetBob. In the hot weather he was riding in a half helmet, jeans and a t-shirt. It looked dangerous but very, very tempting. I’m not spoiled with great, warm weather when riding my Harley here in Norway. The funny thing is that this guy passed us the day before as well. 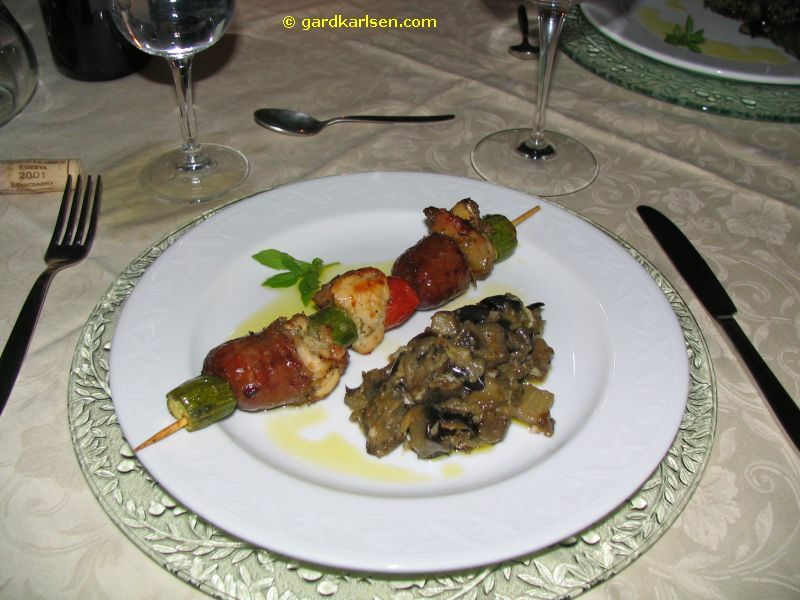 In the evening we were back in Castellina and we had plans to eat at L' Antica Trattoria La Torre located on the town square. When we came there is was major crowd and we didn’t have an reservation of course. So we went for plan B, a restaurant called Albergaccio di Castellina, right outside Castellina but that turned out to be very closed. So we went for plan...eh...well, we just took off south and hoped for the best. We came to Osteria di Fonterutoli connected to the vineyard Fonterutoli. 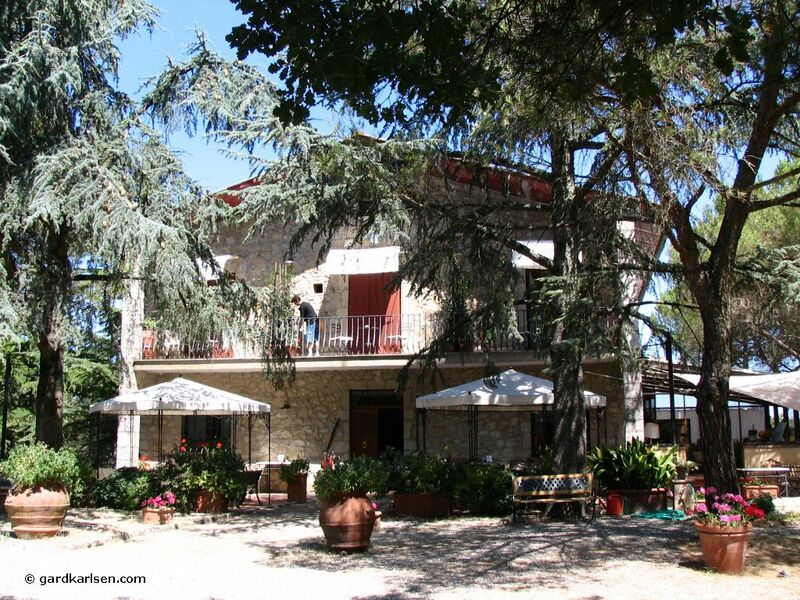 It is located 5-10 minutes drive south of Castellina on the left hand side. The Osteria was not huge but they had both tables outside and inside. 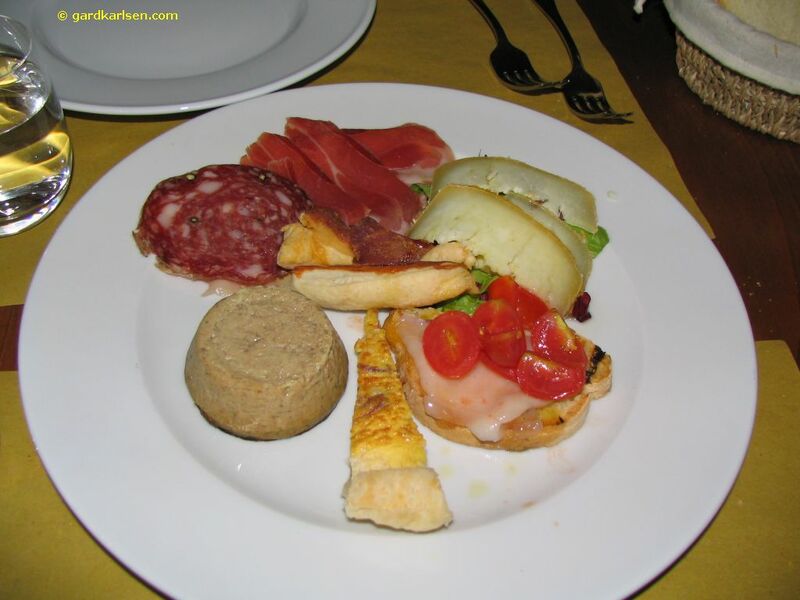 As the temperature drops pretty fast in this area we choose to sit inside and started with sharing a mixed antipasti. It included ham, cheese, liver paste, bread etc. And what do you drink at a place like this? The Chianti Classico from Fonterutoli of course :-) I have to admit that this was not my favourite wine during this trip. It was a bit too spicy and too fruity for my liking but their olive oil was pretty good. Our primi piatti was red wine and tomato risotto and wild boar pappardelle. 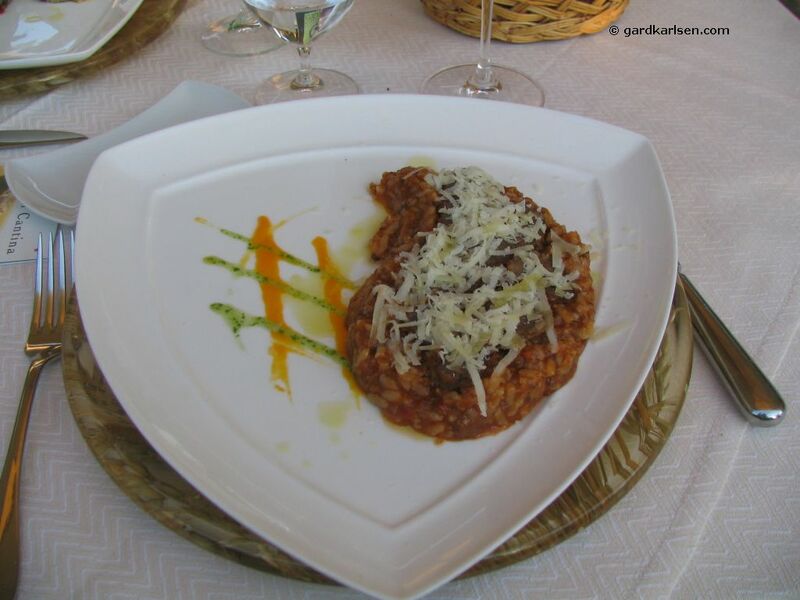 I had the red wine risotto and that was very nice. It is not very often that I get it this way and I have made it myself but I feel that I have not been able to get it just right (yet). 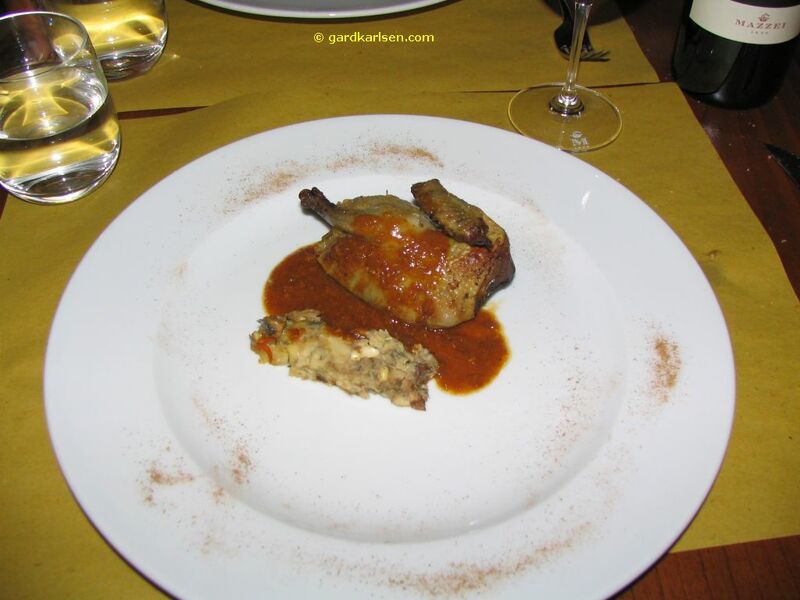 Our secondi was stuffed pigeon for Gard and stuffed rabbit for Nikki and again very tasty but remember that you have to order side dish (see food "rules" in Florence eating and drinking report). After dinner the waiter asked if I wanted some Grappa (see Wikipedia for more info). I said no thanks but when he said that it was on the house I was like most good Norwegians and said "OK, bring it on" :-). I’m not into Cognac and although Grappa was strong as well it had a lot more flavours in my opinion but it is not like I’ll be running out to get a bottle soon :-) The bill for the meal was 93€. 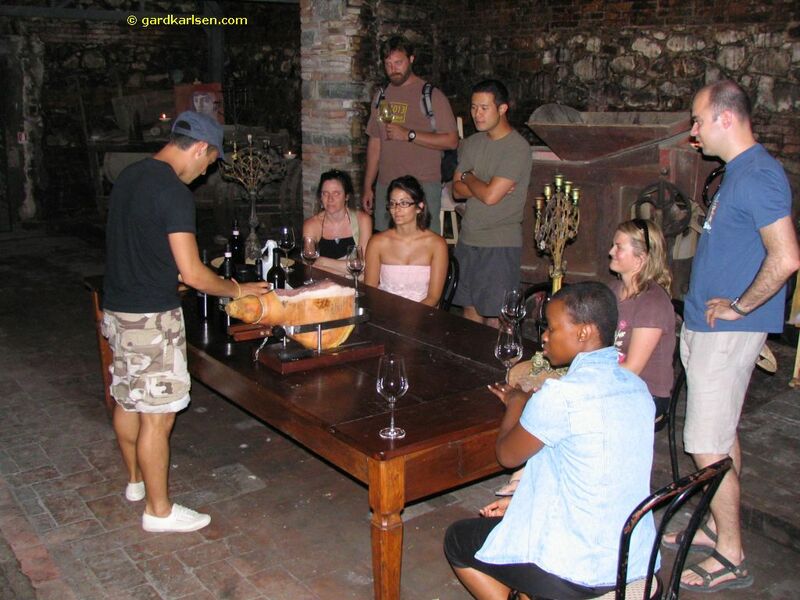 Dievole was located quite close but when we came there we had to wait an hour for the next wine tasting tour. So we relaxed, had some lunch under a huge parasol, enjoyed the scent of the huge rosemary pot plants...ahhh...summer bliss :-) When I went to pay the 10€ per person fee for the wine tour I ran into another Norwegian couple living at Capovento... quite an coincidence. 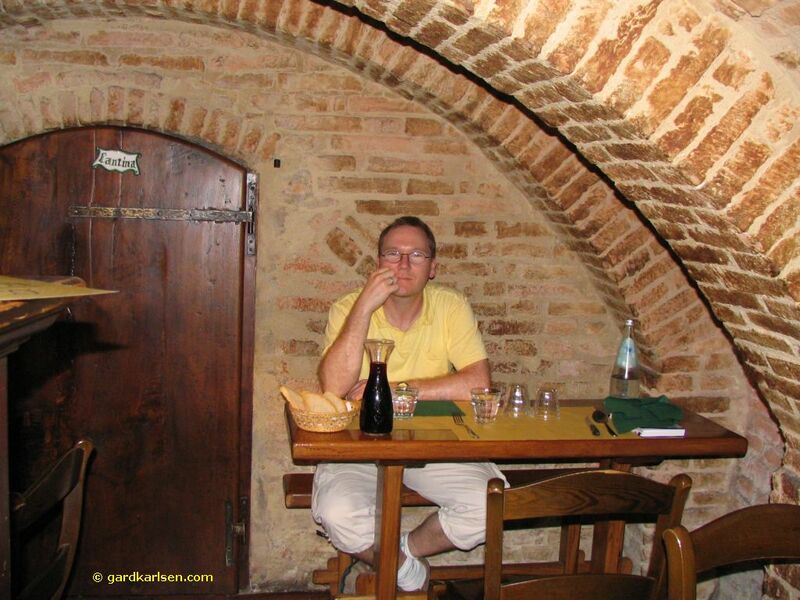 The wine tasting at Dievole started out with a white wine in the small restaurant but we soon moved down to a wine cellar to try the red wine. The wine cellar was cool (compared to the 35 degrees outside) and we got to try some nice red wine and they are also experimenting with mixing their own red wine with other grapes and wines that go well with the Sangiovese grape. I’m not sure that the wine called Plenum was worth the extra € compared to the regular Chianti but what do I know :-). We also got some nice prosciutto carved in thick slices and pecorino cheese during the wine tasting :-) The tour was rounded off with tasting of grappa also made by Dievole. We continued towards Greve in Chianti and we just followed the GPS basically. To start with it did lead us to more dirt roads but eventually we got back on the tar and once again we got great views as we were driving north towards Panzano and Greve. 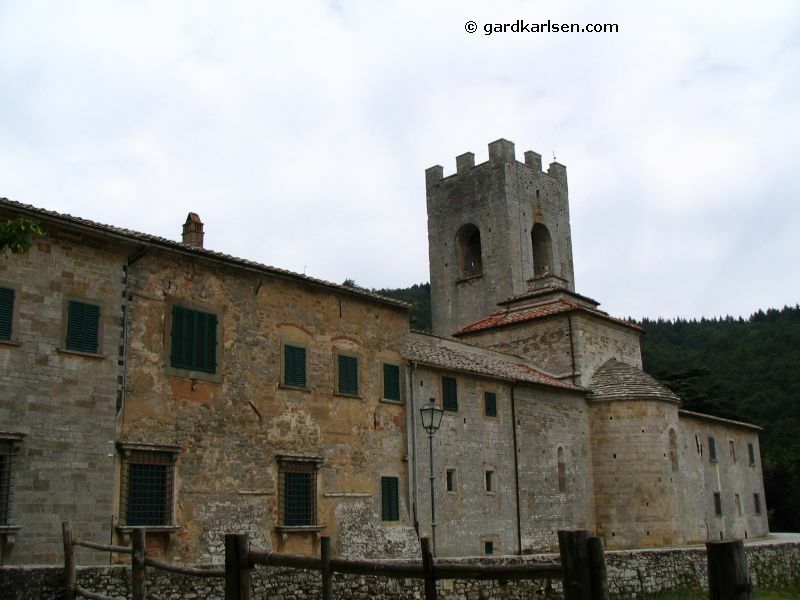 Greve is only located about 15 km north of Castellina and once again we found a small town with a pretty quiet town square. 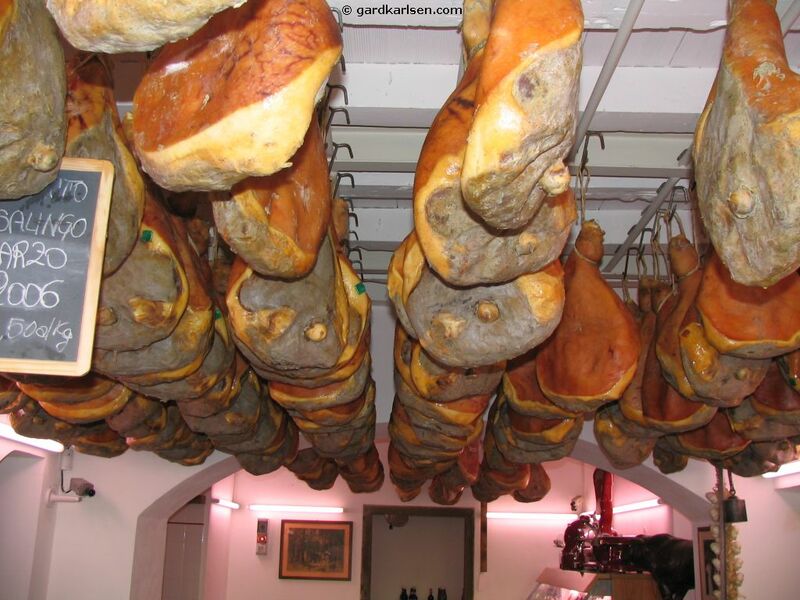 I ended up at the butcher shop Macelleria Falorni and what a treat that was. 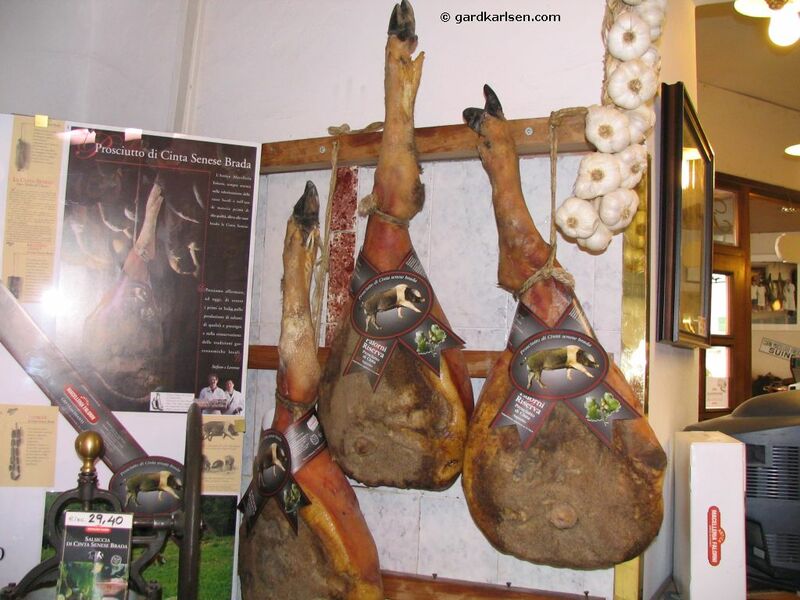 Here I found big hams hanging from the ceiling, salami, pancetta, wild boar legs etc etc. They even had a selection of wine and also a wine tasting machine. You just have to buy a 10€ card and you use this to try about 10 different wines - each of the samples were various prices. I didn’t use all the 10€ and I just got the change at the cashier when we left :-) In the shop there was an old American couple and the guy saw some people coming up from the cheese cellar. He proceeded to ask them what was down there and it was pretty obvious that the people that were coming up did not speak any English. But this old guy continued to ask just a bit louder, as if that would help. I bumped into him again when I bought the wine card that I mentioned and there was a sweet, young girl with lots of freckles behind the counter. The old guy went over to her and asked her “Have you even counted your freckles” before he turned around to me and chuckled. The poor girl didn’t really understand so she was asking “Have I counted what?” I find it pretty rude to make fun of people - at least when you are making fun of them in a language that they don’t understand. In short, I did not chuckle with him, I just gave him the evil eye. 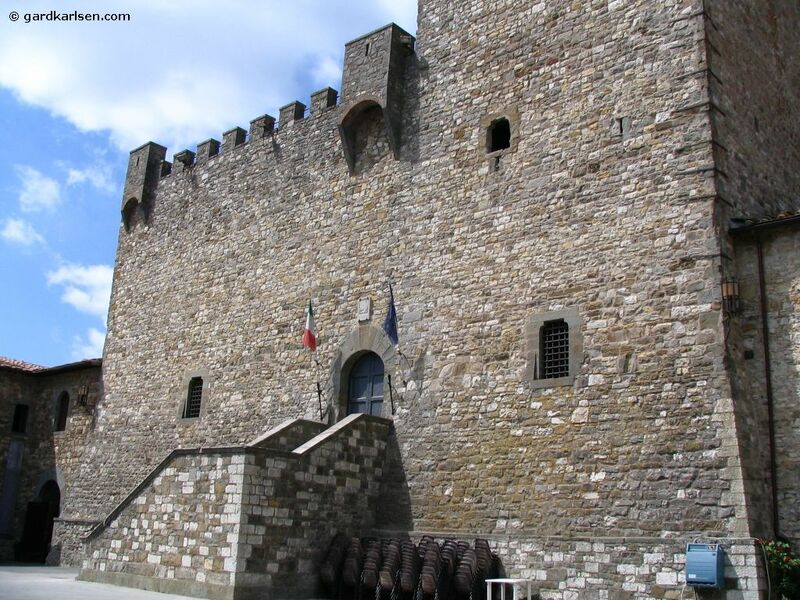 We proceeded to walk through the city and on the way it looked like we were passing through various neighbourhoods (called contrade) because in one part of town there were lots of green flags with a goose on it while in other parts of the town there were different colours and flags. 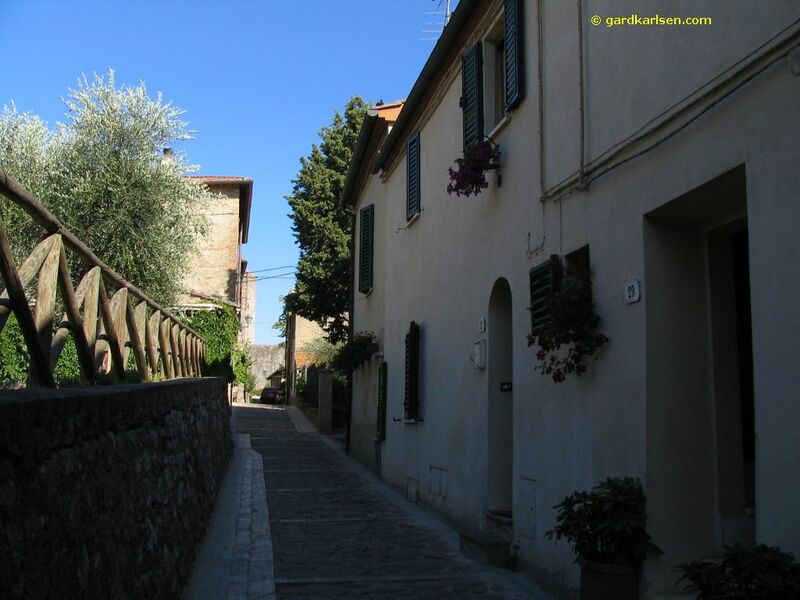 These are neighbourhoods that compete in the annual horse race that takes place on the main square Il Campo. On July 2nd and August 16th the horserace takes place around the square and based on pictures I have seen it looks spectacular. We stopped by Il Campo on our tour and checked out this shell shaped open piazza. 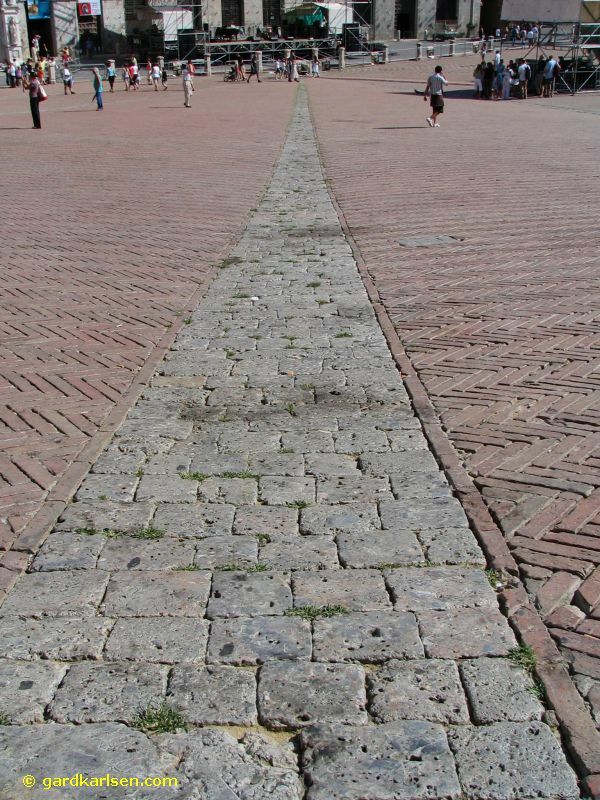 It is amazing to walk across this open space and think about the fact that the stones were laid down in 1349! We did not have the chance to check out the buildings in the area but a building like palazzo pubblico might be worth a visit. This is still the city hall but it is only partially open to the public. If you want a great view it looks like torre del mangia is a great option. 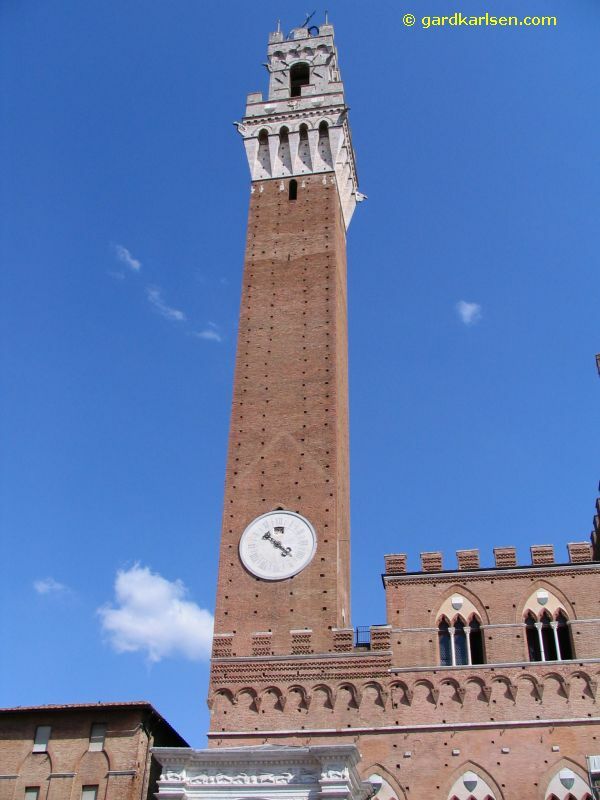 This bell tower next to the palazzo pubblico is 102 meter high and stands out in the city view. 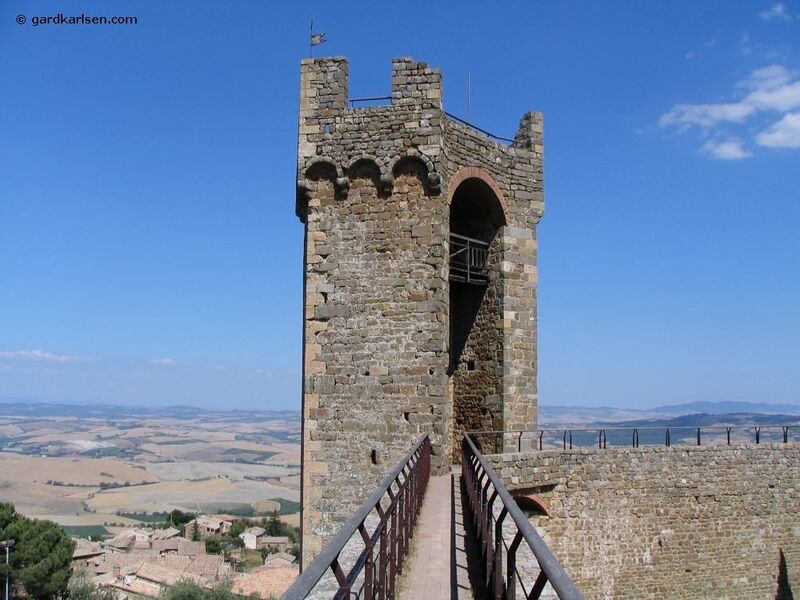 So if you can take the 500 steps to the top I’m sure you will have an excellent view of Siena and the surrounding area. 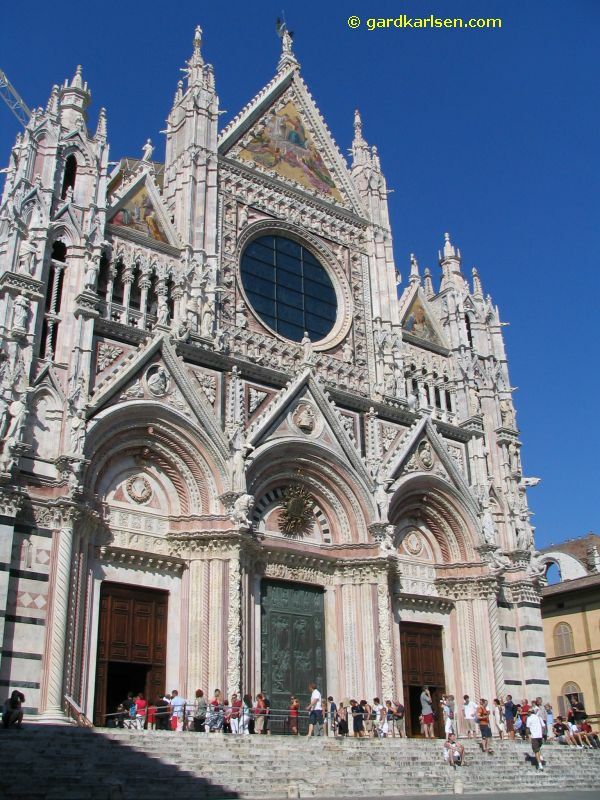 But I think the highlight of the tour was our visit the Duomo of Siena. Our guide bought some tickets at the back of the church so that we could skip the line (I think we had to pay about 3 € per person). The interior of the church was breathtaking and far more beautiful that the Duomo in e.g. Florence. 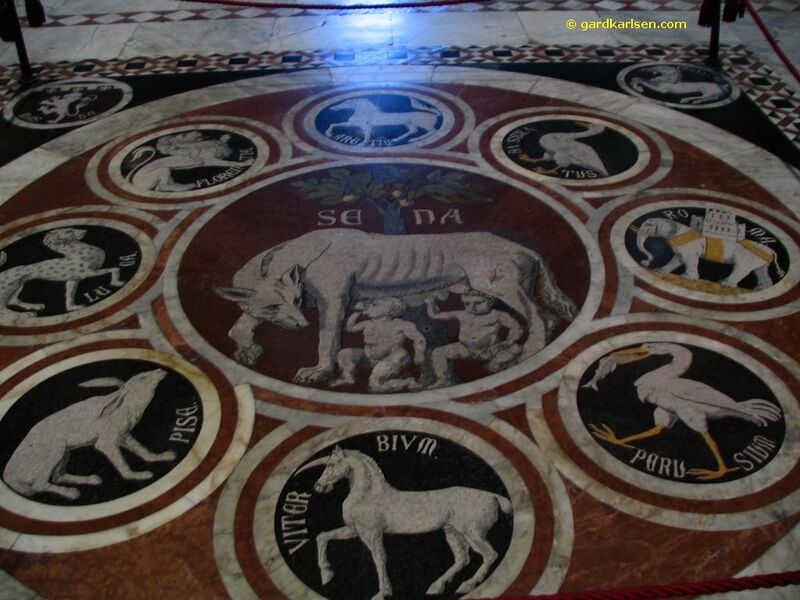 The first thing we noticed was of course the beautiful marble floor with inlaid images with various scenes from e.g. the bible. Note that parts of the floor of the Duomo are covered up and it is only uncovered for a period of time in September / October. Another part of the church that I found beautiful was the Piccolomini Library. 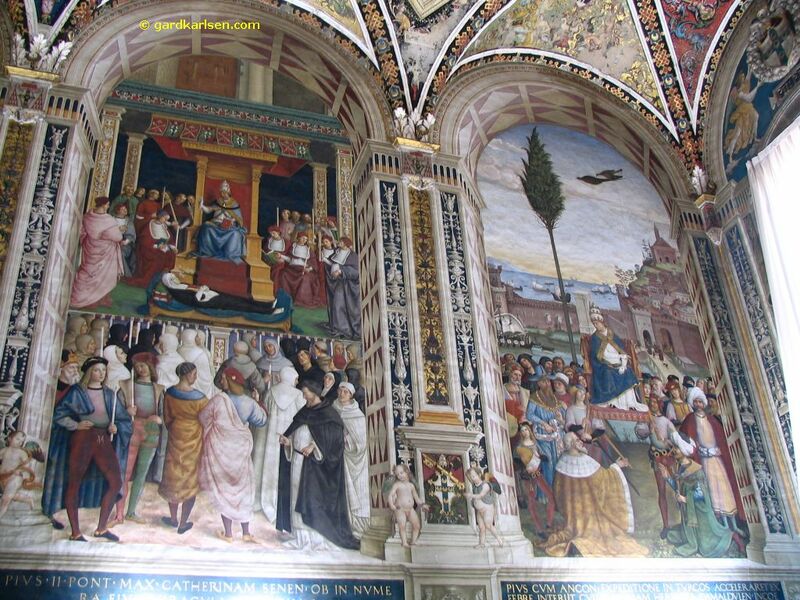 The frescos in the library show scenes from the life of Pope Pius II and according to our guide the frescos were made by Pinturicchio with a bit of help from Raphael and the room was sealed off for a long period of time. I guess this is the reason why the frescos looks like they were made recently as they still have bright and beautiful colours. 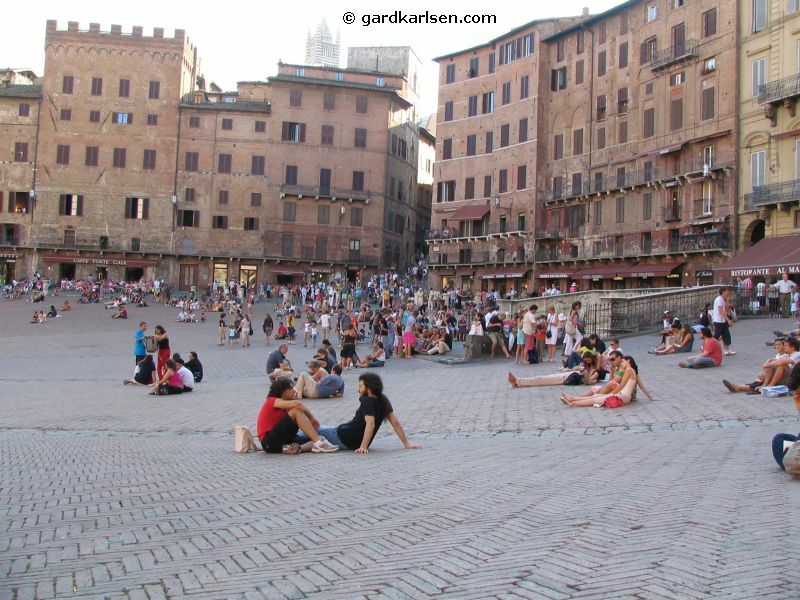 After the tour we just went back to Il campo and relaxed on the piazza and planned the dinner for the evening. 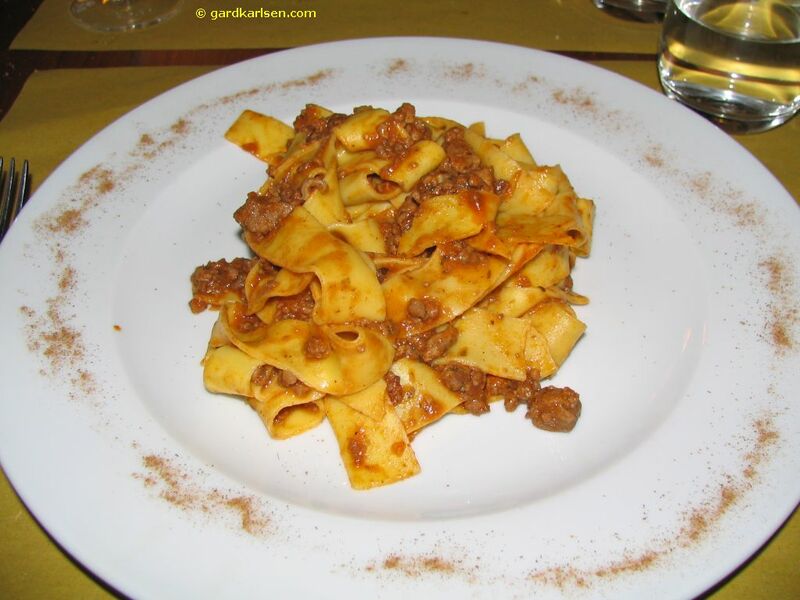 In the guidebook we found a recommendation for L’Osteria on Via del Rossi 79. 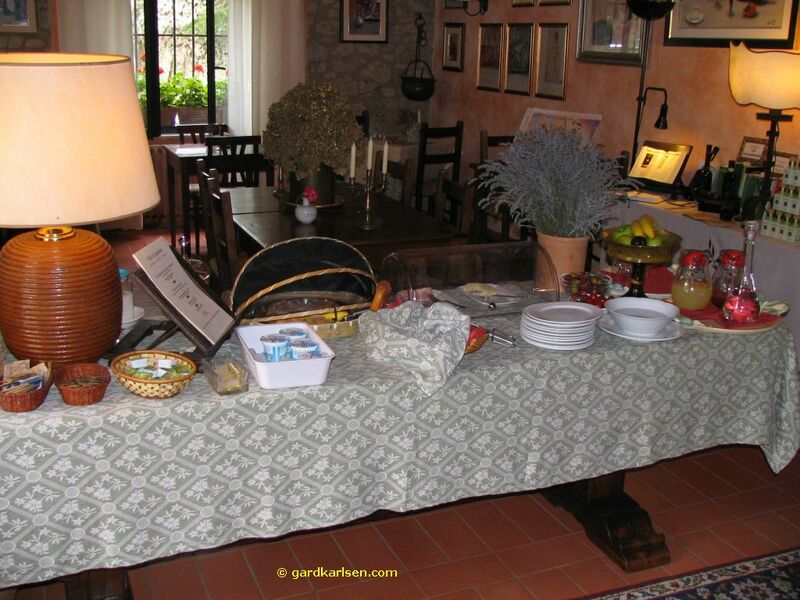 When we came there it turned out that the guidebook was correct: it was a informal place with simple but tasty Tuscan food. We got a bit of house wine and shared an antipasti consisting of bread, bread with liver paste, ham, olive, salami etc. 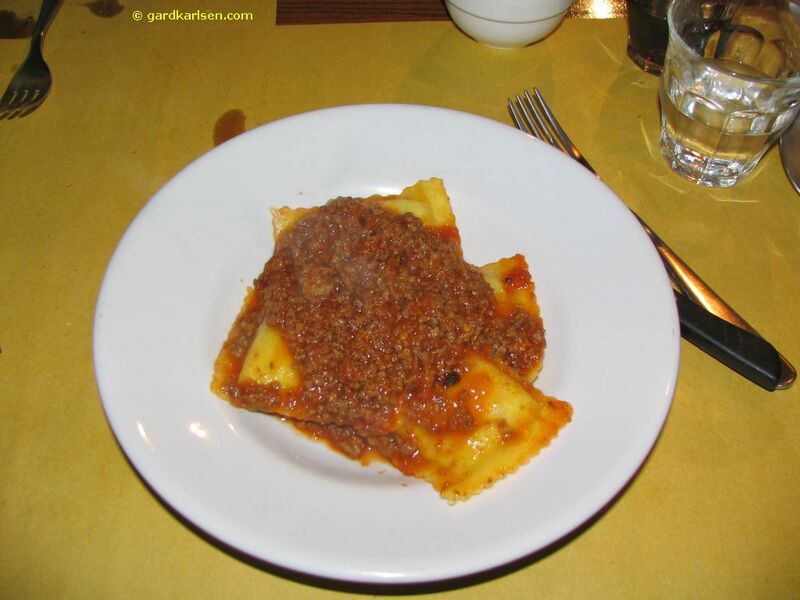 The menu was completely in Italian so we did struggle a bit to decipher it but luckily we got some translation from the waitress :-) I had something called maremmani al ragu for primi piatti and that was huge ravioli with spinach and a meat sauce which tasted excellent. Nikki had Pici all'Aglione which turned out to be thick spaghetti with garlic. We both went for secondi as well and I had bocconcini di vitello al Chianti. 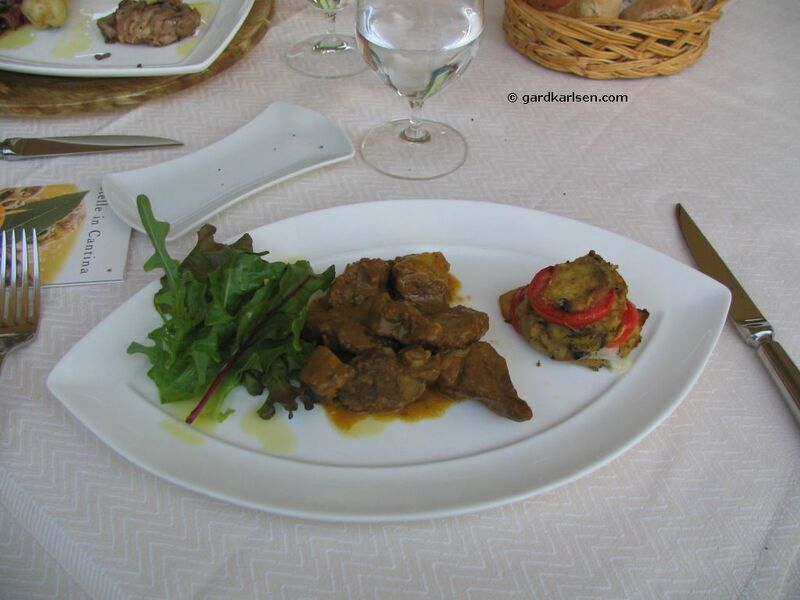 This is a veal meat stew made with Chianti wine and I love stews like this and the meat was cooked until it was tender :-) Nikki had a similar stew but made with wild boar and she also seemed content with the dish. The meal cost us 52 € and we were stuffed when we came out of the place but "unfortunately" there was a gelateria straight across the road from the restaurant and I ended up going in there getting a ice cream for 2€ with 3 different flavours. Right there and then I was a happy chappy but I was pretty much stuffed to breakfast the next day. So at about 10 pm we left Siena after paying the 13€ parking fee. We didn’t have too much trouble finding our way home thanks to the GPS. Siena is a beautiful place and I would really recommend that you use a couple of days to check out this town. Yes, there are also many tourists in Siena but unlike San Gimigano it seems like Siena is not completely overtaken by the tourists. It seems like the town still has “real” inhabitants that are proud to live here and they have history and traditions. 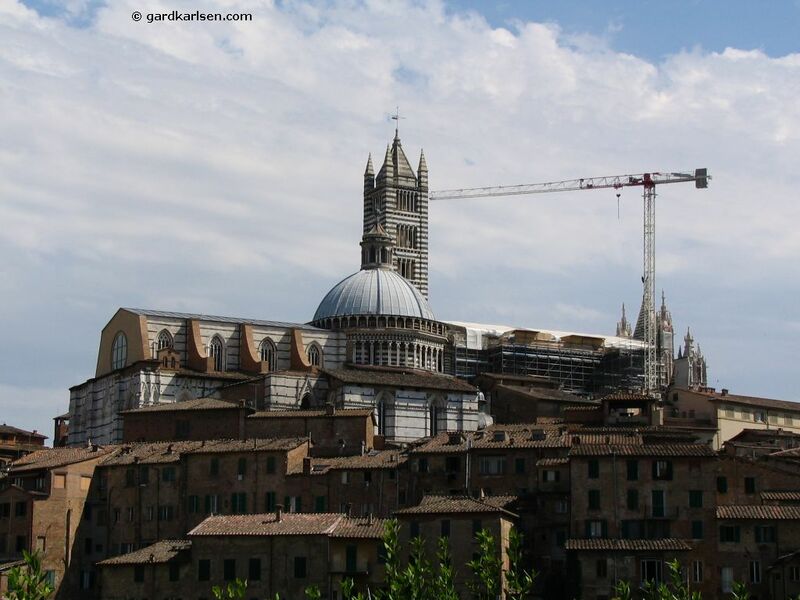 If you have the option of the two above mentioned city there is no doubt in my mind - I would visit Siena. 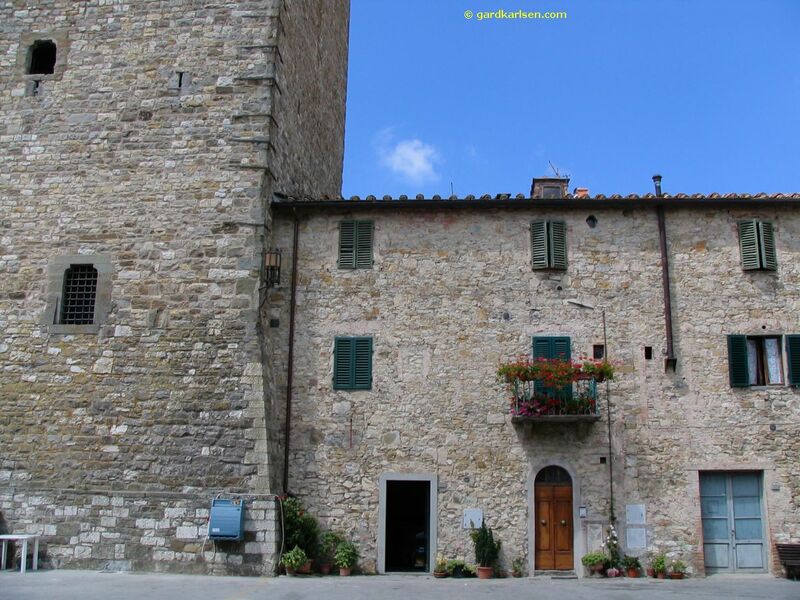 The next morning we took off southbound again and this time our destination was the town of Montalcino located in the area where brunello wine is produced. 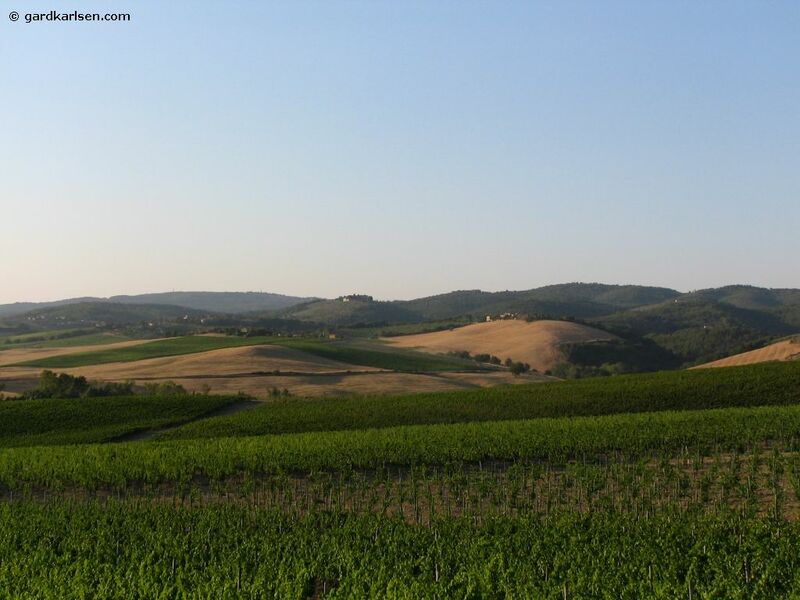 Montalcino is located about 60 km south of Castellina and it is located 500-600 hundred meters above sea level and hence we had to climb a few hills to get there. 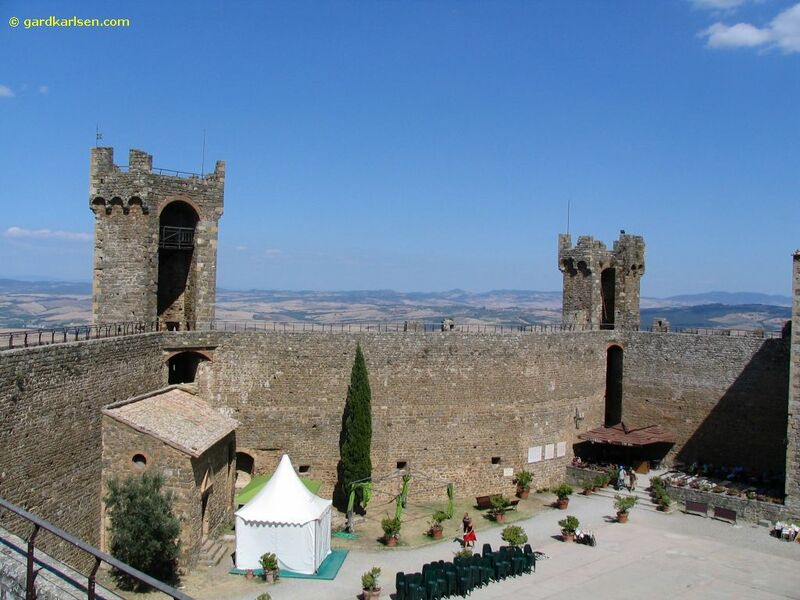 We parked near the fortress of Montalcino and walked around this small hillside town. 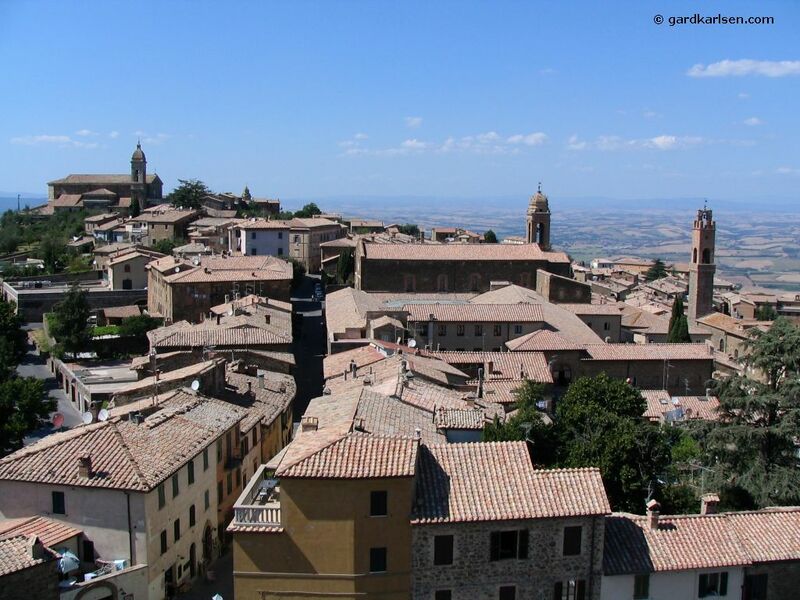 As we came in the middle of siesta even the tourist information was closed to we went to a small place called Enoteca Osteria Osticcio where we got a table by the window and had a superb view of the landscape around Montalcino. It was nice to just sit there and look out over the Tuscan landscape while we saw a small hummingbird visiting the flowers right outside the window. 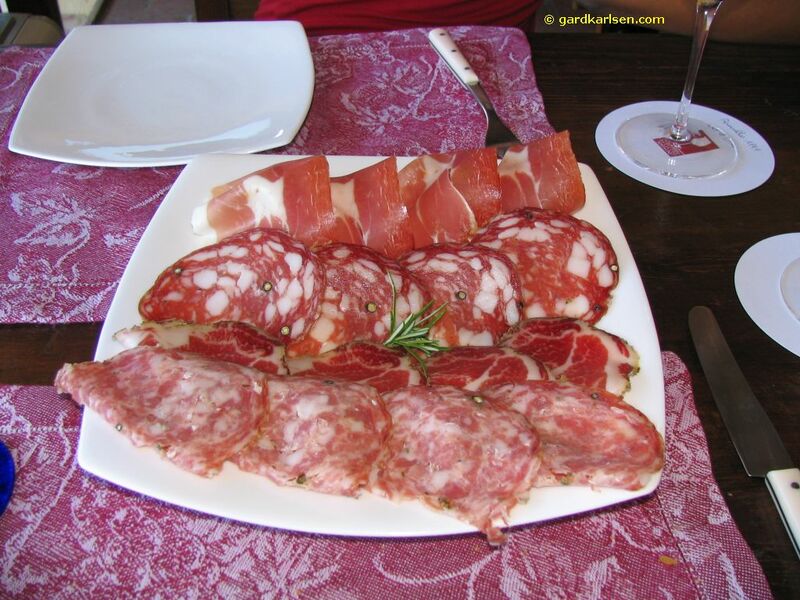 We ordered a plate of mixed ham and salami and a taste of three different Brunello wines. We got Ville de Prote 2002, Azgiano 2001 and Col D’Olicie 1999. Having wine and ham was delicious but I’m not sure that the Brunello wines are worth the extra euros. In my book a good Chianti is just as good but maybe there is something wrong with my palate :-) We paid 45 € for the lunch including the Brunello wine tasting (14€). After lunch we visited the 14th century fortress built by Cosimo the 1st and for 4€ we were able to climb up and take a walk around the walls of the fortress and once again the view was amazing. 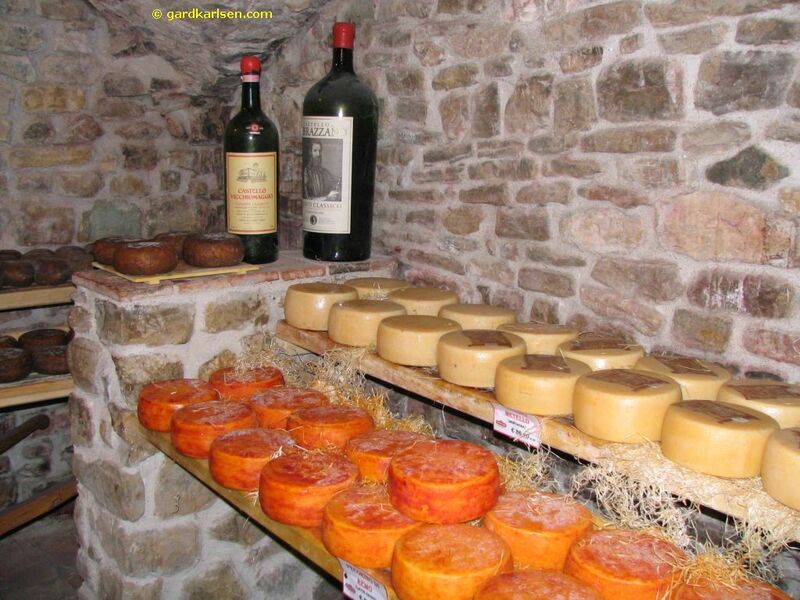 There are wine shops all over town and even inside the fortress there is a shop where you can taste and buy wine. 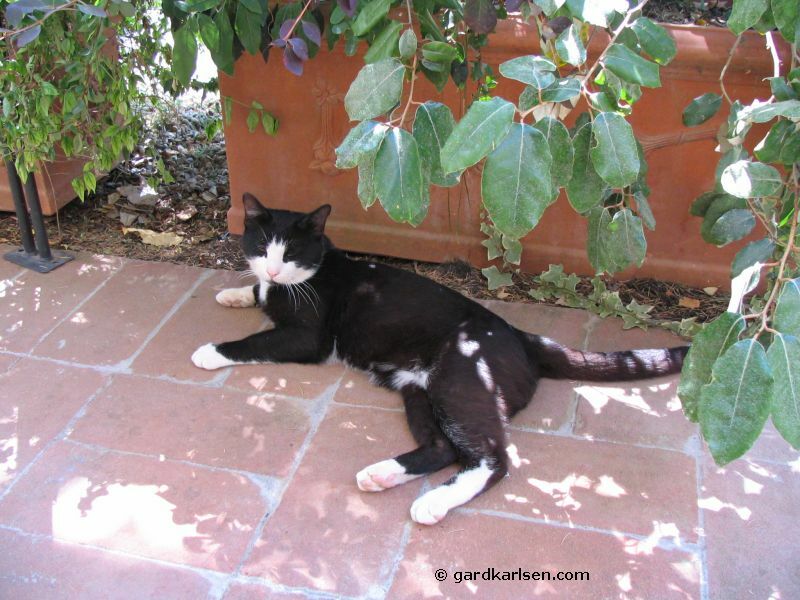 On the agenda this day was a visit to Fattoria dei Barbi . I got a bottle of Brunello wine from this winery from my brother for my birthday this year. I had checked out their homepage before we went to Italy. 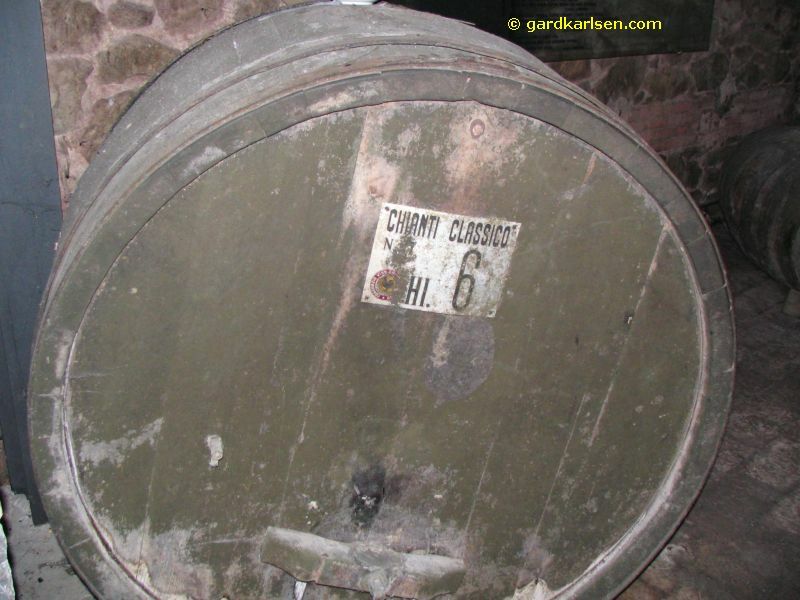 Their homepage says “You can take the opportunity to have a guided tour of the cellars where the famous Brunello di Montalcino is aged. No bookings or payments are required (as long as there are no more than 8 in your group) just the pleasure of your company!”. But I had done one minor mistake - I had forgotten to print out the driving instructions. But on the way to Montalcino we saw one sign with Barbi on it so we drove back to this point and asked for instructions and of course it turned out we were in the wrong place. To make a long story short: we drove around for 1 ½ hours before we found it. Italians are not that great when it comes to putting up signs in intersections. So sad but true, we came too late to get a guided tour. 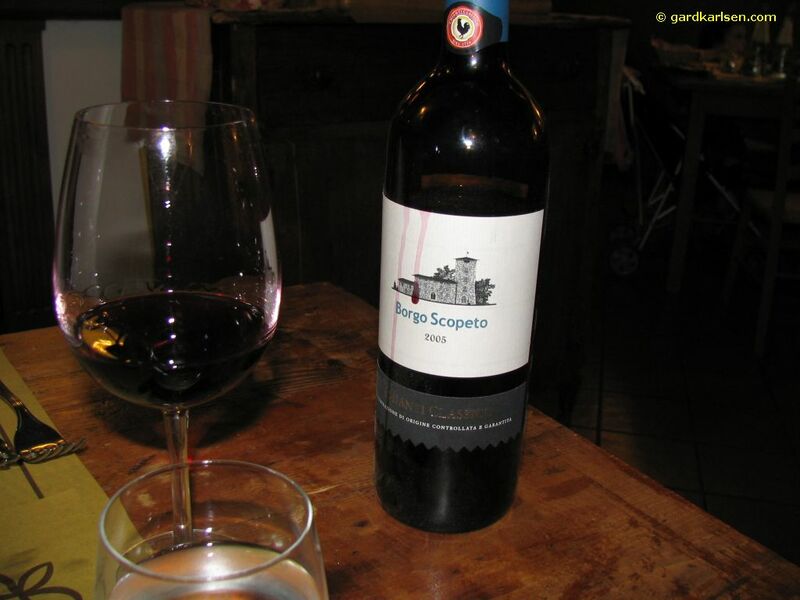 But we did get to taste some Brunello wine and I did end up buying a bottle (40€ for a 2001 riserva). Make sure you study the map before you head off or print out the driving instructions. 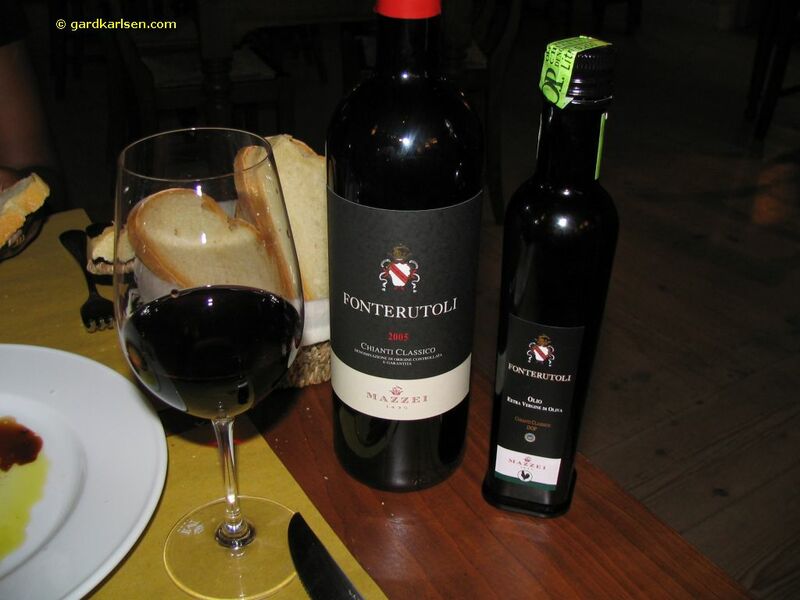 That night we had dinner at Antica Trattoria "La Torre" in Castellina in Chianti. 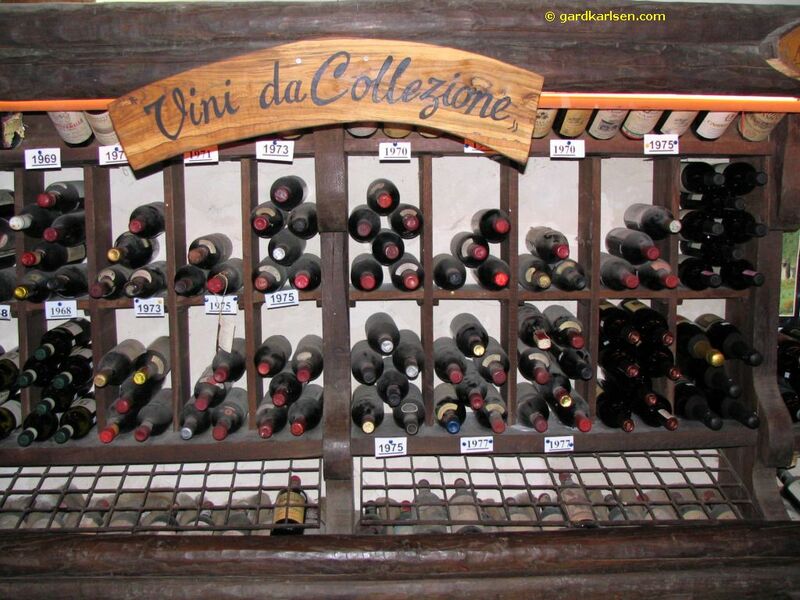 They had an excellent selection of local wine and we chose to go for a bottle of Tenuta Sant’Alfonso from Rocca delle Macìe. I had gnocchi as primi while Nikki had a mixed starter. 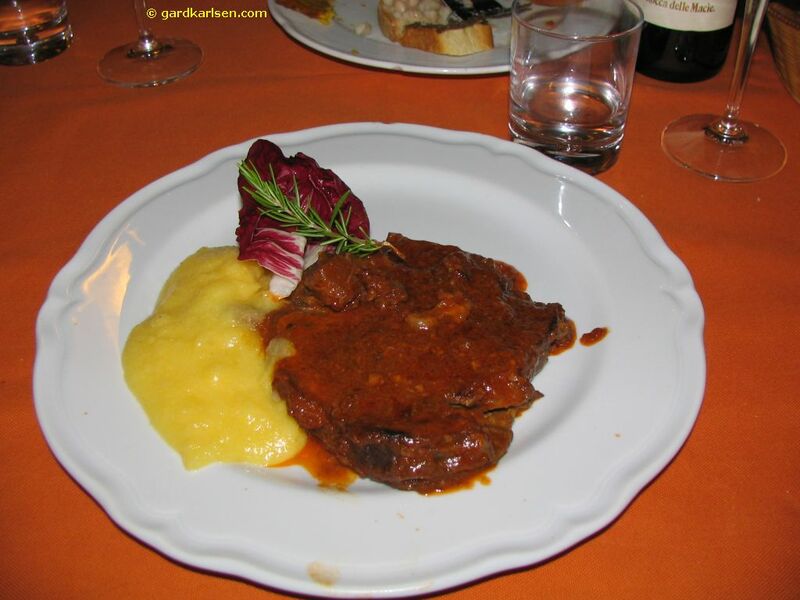 As our secondi I had osso bucco and Nikki had veal stew. The food was pretty good but not the best we had on this trip and maybe a bit too salty. The bill was 57€ including the 18€ bottle of wine. On our last day in Tuscany we just relaxed walking around in Castellina, had a swim in the pool, sent some postcards, had a good lunch at Ristorante "Le Tre Porte" etc. I would just like to mention the meal we had on our last evening. 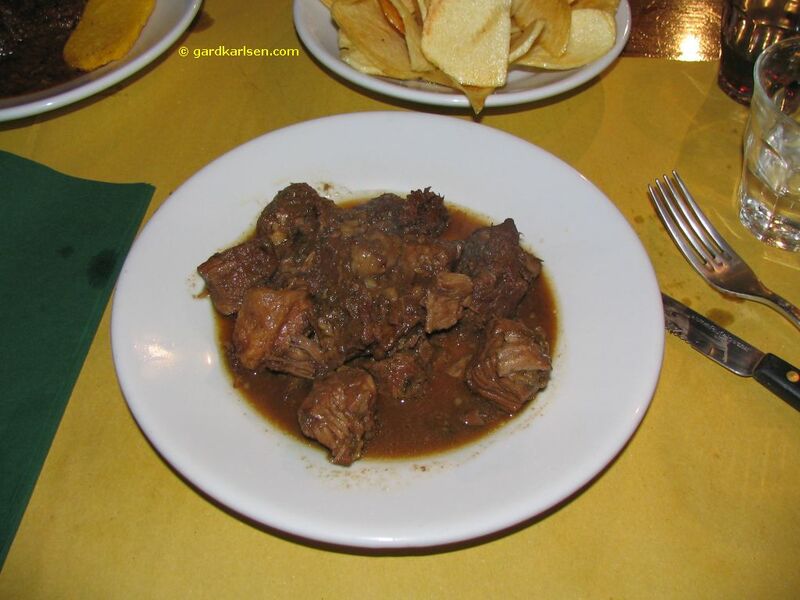 We went to Ristorante Albergaccio di Castellina (our plan B some nights before). We didn’t have a reservation but we got a table outside and we understood pretty fast that this was a better restaurant. I had a lovely tomato based risotto with meat as primi piatti while Nikki went for some cous-cous. 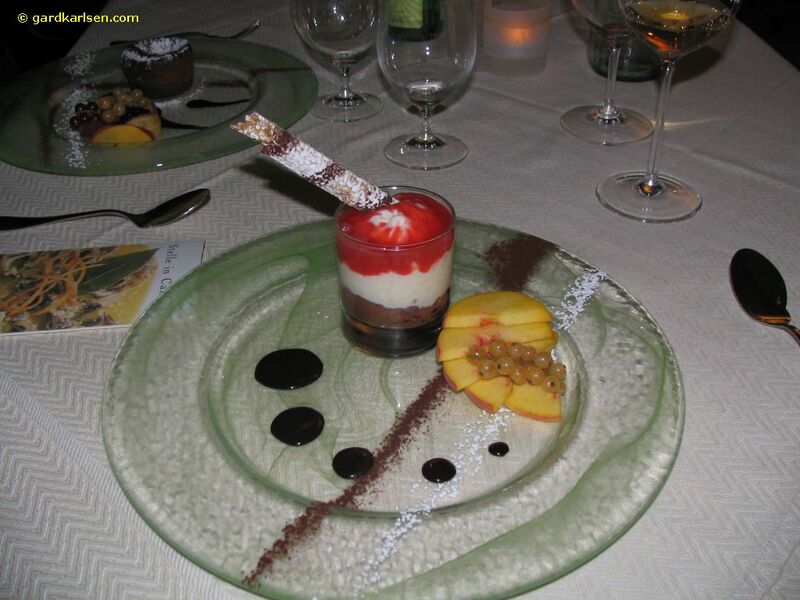 As secondi I had the Tuscan lamb while Nikki went for the mixed grill, everything was beautiful presented and tasted excellent and for once the bread we got at the table was fresh and tasted great :-) We also had some dessert - chocolate cake and Tiramisu. The meal cost 115€ (including 3 glasses of wine). This was one of the best meals that we had on our trip. I still find it pretty amazing that a small town with only 3000 people can have that many good places to eat. 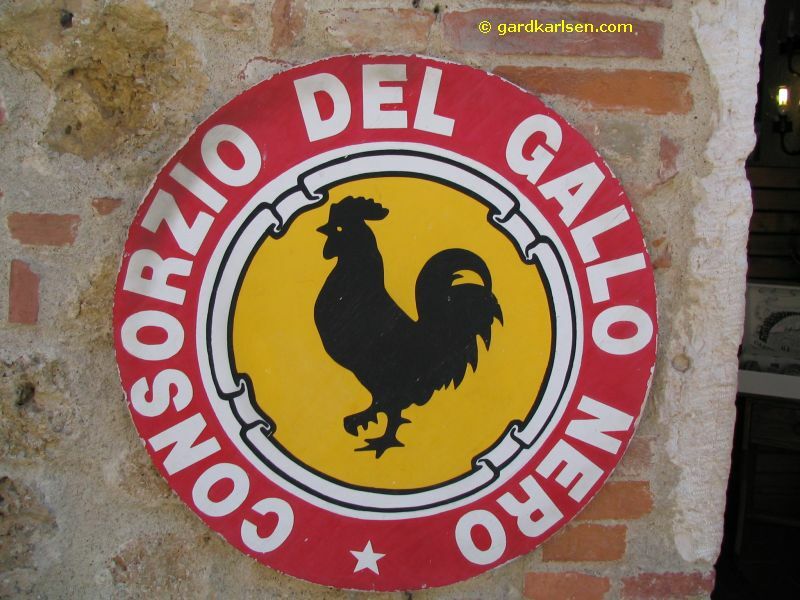 There is even a place called Ristorante "Al Gallopapa" which has a Michelin star! Tip: Temperature can drop pretty fast at night. When we came to the restaurant mentioned above it was about 28 degrees. When we left it was about 22 degrees and it was starting to get a bit cold. So be sure to remember to bring an extra top if you are going to sit outside at night. On the morning of Friday July 27th I woke up when Nikki almost crawled into me as something came in the window. It turned out that it was the cat that was doing a kamikaze attack. But we didn’t get to sleep much more as we had to get of at 5 am as we had an early flight out of Florence, As we started our drive the sun was about to rise and it was still cool outside. Nikki mentioned something about being disappointed about the lack of wildlife considering it was sunrise and the roads were almost deserted. She spoke too soon, all of a sudden a deer came running out of the side of the road and I was seconds from ramming into it but fortunately the car only scraped it on the side. I’m pretty sure that it made it without any injuries but it probably ran away with a bit of a head ache. Later on we also saw a pack of foxes in the middle of the road. Once again we trusted the GPS and the 60 km towards to Florence airport took about 1 hour. We parked the car, dropped of the key at the AVIS counter and checked in. I don’t recommend shopping at Florence airport as it seemed like it was a lot more expensive compared to other prices I saw. One example is parmesan cheese that cost 29€ pr kg at the airport while I paid 16€ in Greve. 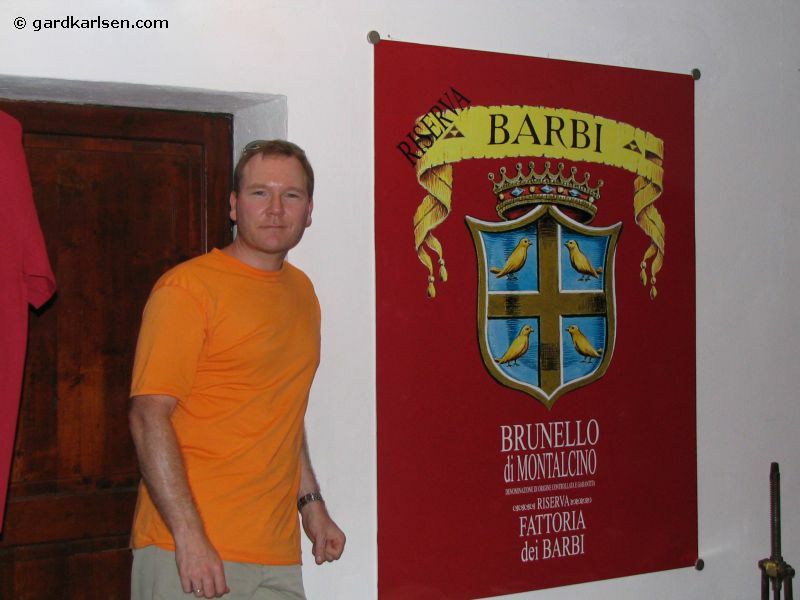 And a bottle of Brunello wine from Barbi cost 62€ at the airport while I paid 40 for it at the Barbi winery. 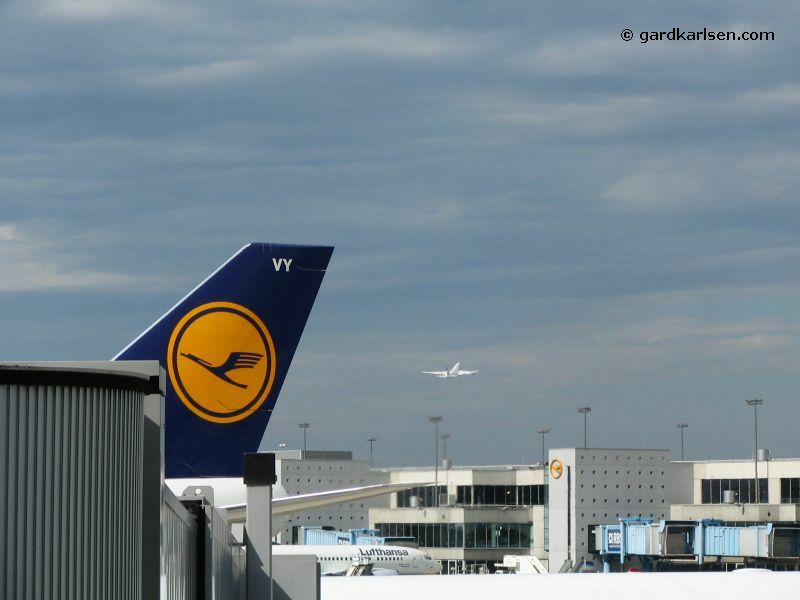 We flew Air Dolomiti to Florence to Munich, Lufthansa from Munich to Oslo and then home to Stavanger with SAS. We left a sunny and warm Florence and landed in a damp, windy and cold Stavanger in the afternoon. 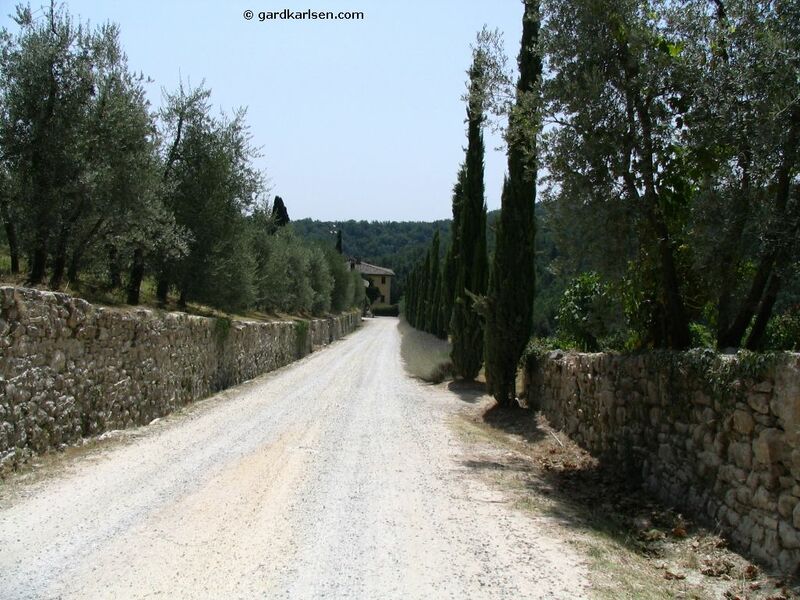 Wondering about the weather in Tuscany? Check out weatherbase.com to get some weather stats so you know what to expect. And check the weather forecast right before you go so that you know how cold/warm it could be. Which forums to ask questions: Try TripAdvisor, Fodor’s, SlowTalk, Frommer’s and Travelers to Go! Do you wonder how far it is from one place to another in Florence/Tuscany? Why not use Google Earth/Google Maps to measure? I find this to be a great tool. In Italy different from the rest of Europe? Check out this short movie to find out. Would you like to print this report? Try to print this PDF file for a better result.